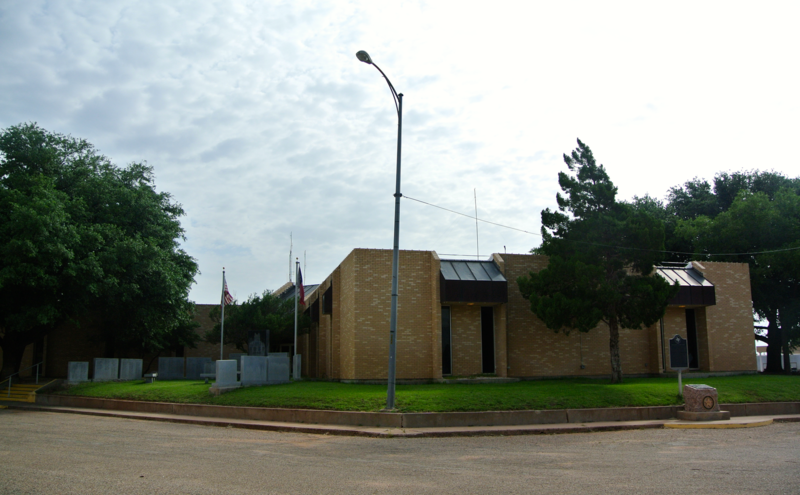 Summer 2013 was the most successful one to date, with a total of sixty-five courthouses obtained in a three month period from places as far away as Cameron County at the tip of South Texas and Dallam County at the very top of the Panhandle. That summer was the first time I’d left my general part of Texas for the project (except for the Hill County/San Antonio region). 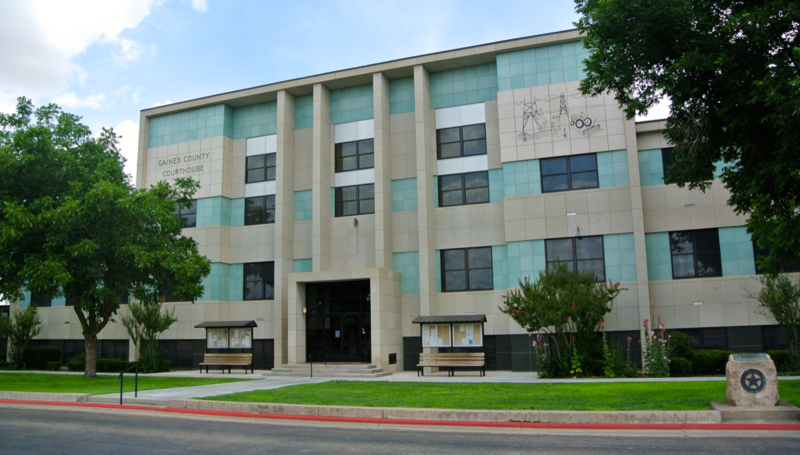 And though I got to visit Childress, Kingsville, Tyler, Lockhart, and many others all for the first time, my summer would not have been nearly as rewarding had it not been for the trip I embarked on in August, just a week before school went back into session. 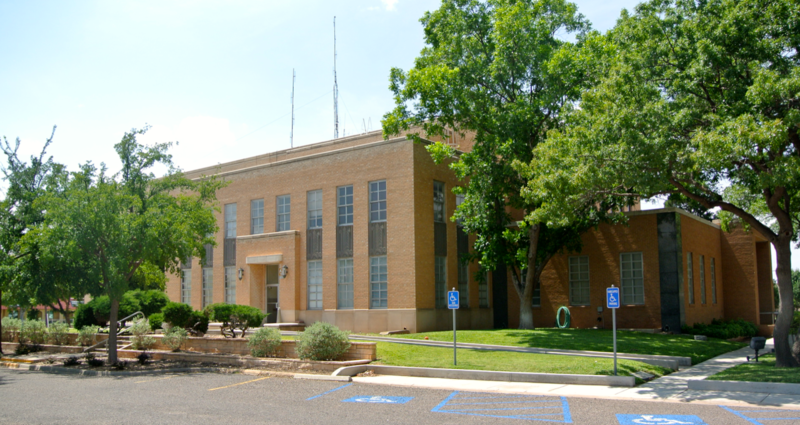 My journey to the Trans-Pecos region in far West Texas accrued twenty-seven courthouses in four days’ time (the record for most in any one trip). 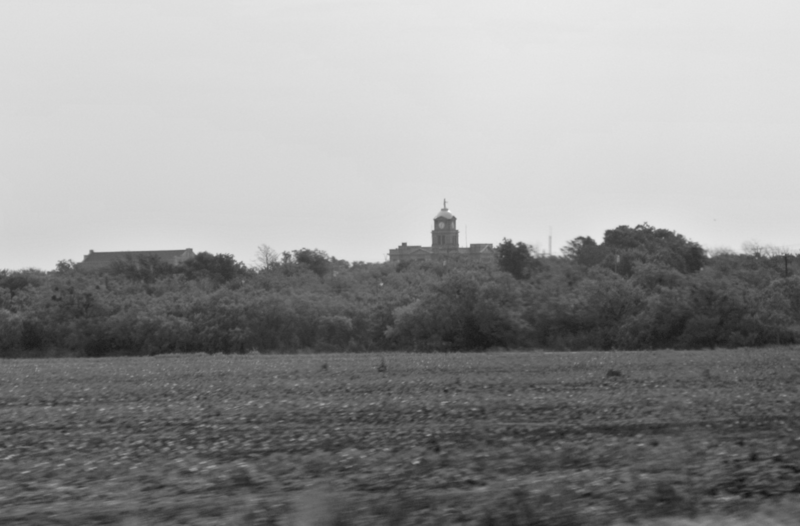 Now only nine of those counties lie west of the Pecos River, so the remaining eighteen ranged from as close to home as Brownwood in Brown County and as far away as Mentone in Loving County and Del Rio in Val Verde County. Some of this you might be familiar with if you’ve read about my previous trips. 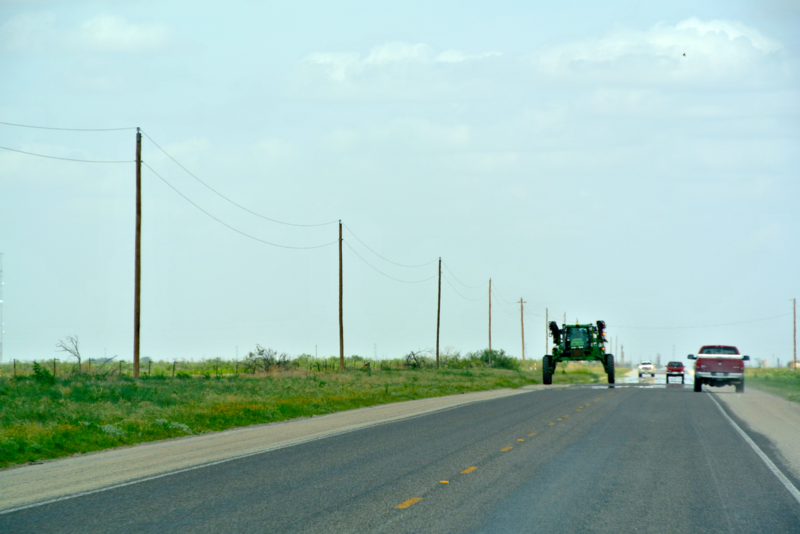 Because for the second (and last) time, I set out for West Texas on July 3, 2015. My intention wasn’t to rival the record previously set by my first trip in August 2013, but I’d put this one into second place nonetheless. We’d achieve a total of eighteen new, and we stopped back by a few old favorites here and there. Our first stop in the morning was Anson, seat of Jones County. 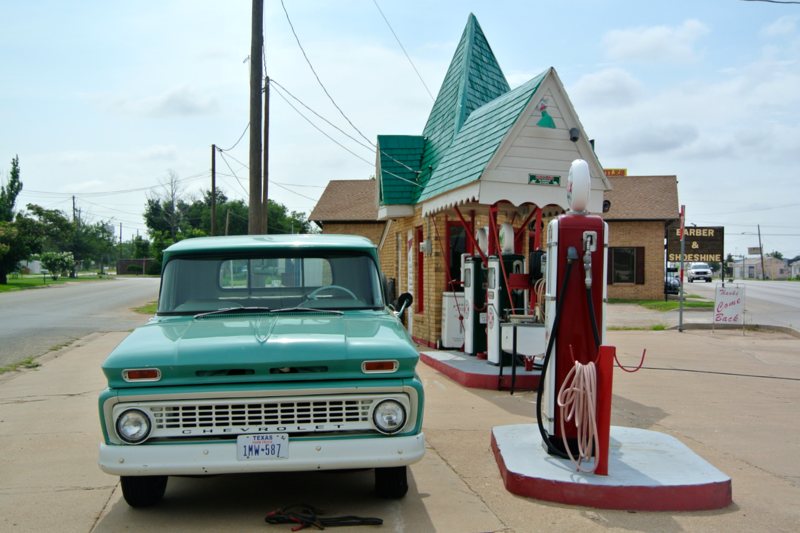 I’d first visited Anson during that 2013 Summer as well, on my way home from a Colorado/New Mexico road trip. 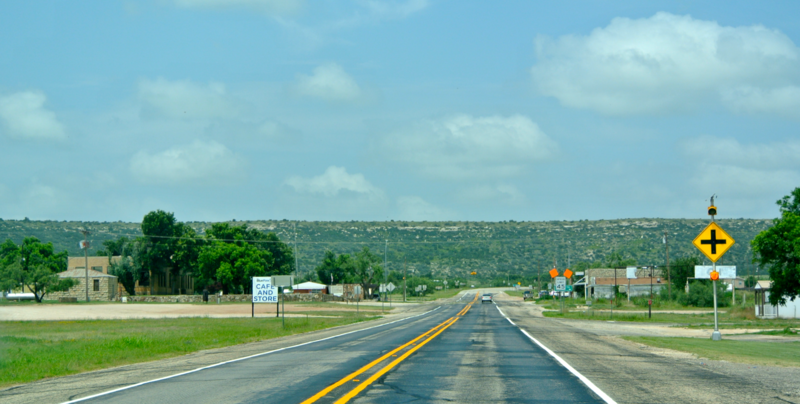 Located just north of Abilene, it lies along most routes from the Panhandle and South Plains down to Interstate-20. As a result, I’d been back through two other times, but during neither did I take any pictures. I figured while I was here, I might as well use my camera (I still used the iPhone when I was here last) and do the Jones County courthouse a little justice. For a good part of the twentieth century, both it Jones County and its neighbor Stonewall County had imposing circa-1910 designs of local architect Elmer G. Withers. 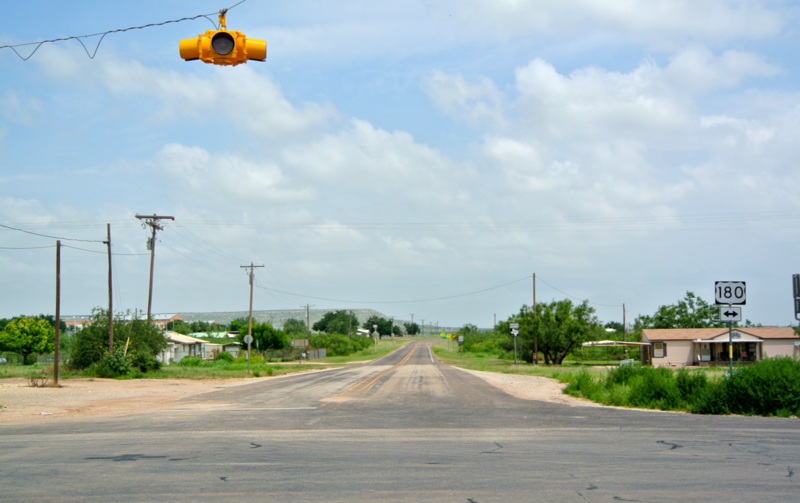 While the people of Anson retain theirs, Aspermont citizens are not as lucky. What stands there is a modern catastrophe straight out of 1970-something. No thank you! Anson/Jones County belong to only a handful of unique seat/county name pairs scattered throughout the state. What’s curious is that both are named to honor the same person. 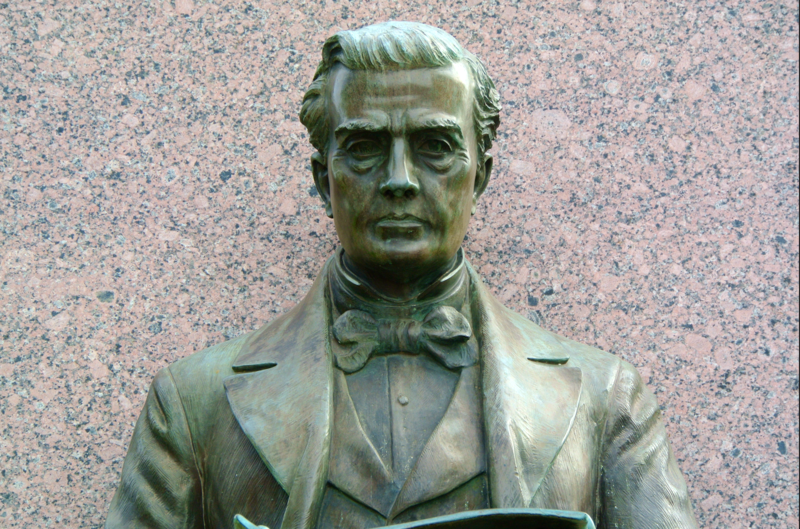 In this case, the namesake in use is Anson Jones, the fourth and final president of the Republic of Texas. A statue of his likeness graces the courthouse grounds and casts an eternal glare down the highway. 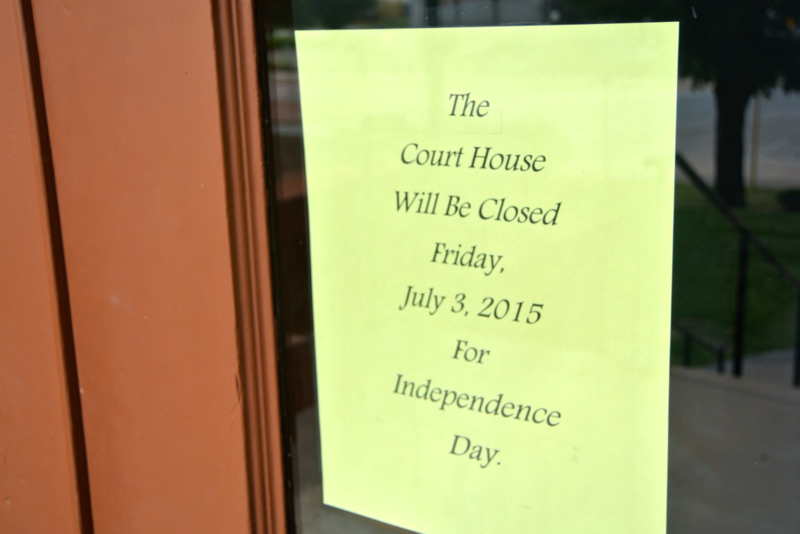 July 4, 2015 was on a Saturday, which meant that Friday was the day that it was observed for all county employees and most employees anywhere. Unfortunately for me, almost every courthouse I’d see today would have one of these same signs. Well I didn’t get to see the inside, but that didn’t stop me from capturing the elegant outside. The Anson “square” is a series of buildings on both the west and east sides of the courthouses, while the north and south sides boast more of a “main stretch” scenario. That’s because a large traffic circle rounds the building and provides an interesting city planning setup. 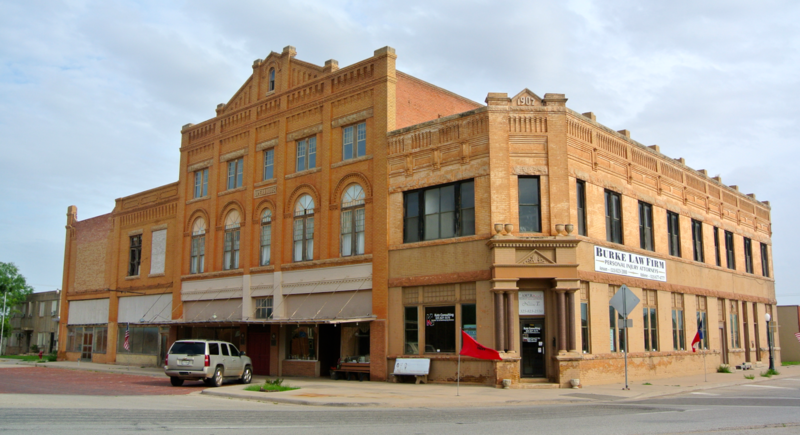 To the northwest of the courthouse is the impressive, historic Anson Opera House, constructed in 1907. 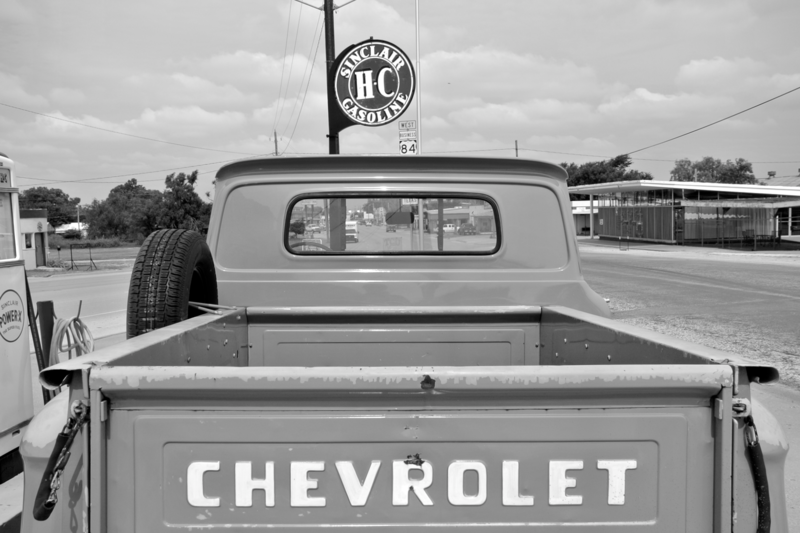 I’m biased, but I prefer my home town Granbury’s more. This is still a lovely building, though. What a great omen for the rest of the day! It held true. And so we left Anson in the dust, and peeled off to the west, heading into territory yet to be charted by the courthouse project. 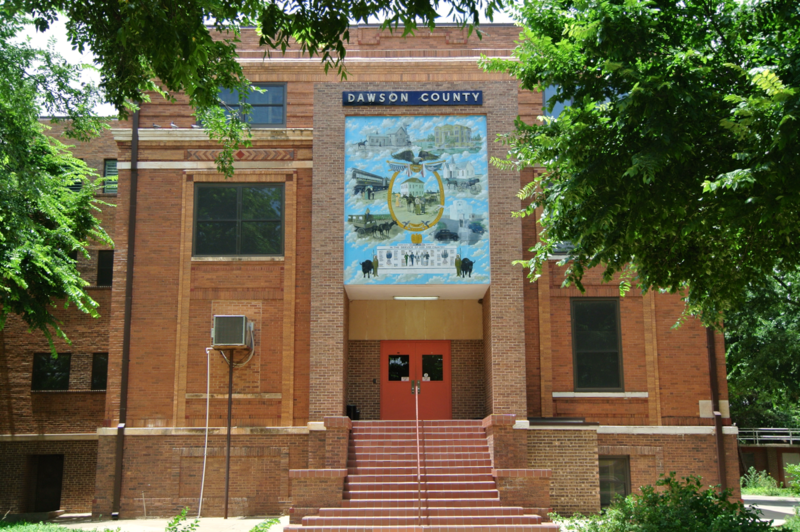 Every time I’d ever entered Anson before this day, I’d come in from the north (from Aspermont/Hamlin), and I had always marveled from how far the Jones County courthouse is visible. As it literally towers over the cotton fields and flat plains outside Anson, it’s a constant shape on the horizon for miles. Approximately a third of the way to Roby, the next county seat, I could still make it out in the distance. I reflected later that it was as if the courthouse was begging me not to leave, warning me for where I was headed. Wading into Fisher County, we were entering a “sea of modern courthouses” that stretches all the way to the New Mexico border. 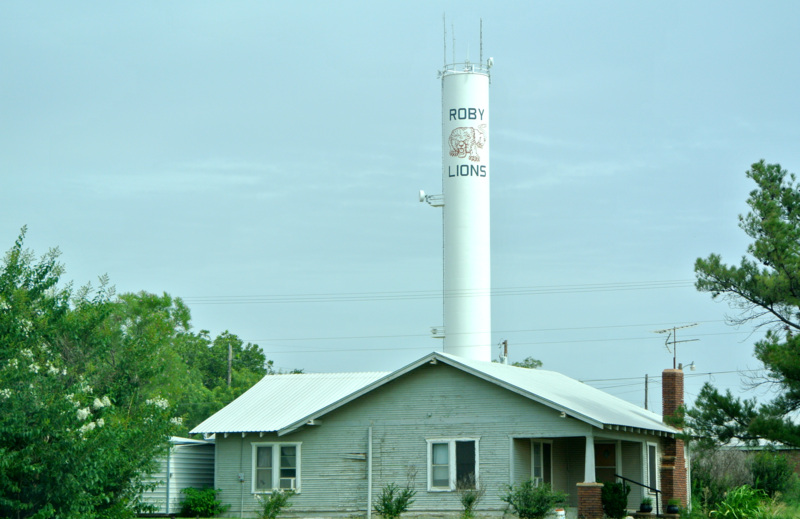 Roby’s a small town, a speck on the plains at the cusp of the oil, cotton, and wind energy regions, but too far south to be called the Panhandle. In the 1800s, this was bison country, and attracted the plentiful buffalo hunters that ultimately proved to be the undoing of the Native Americans (well, them, and American military intervention). 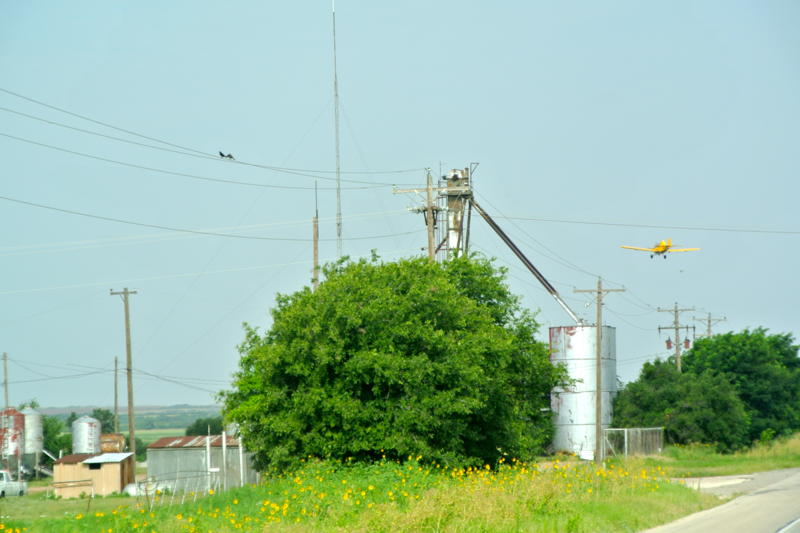 On our way to Roby, we passed underneath a crop duster making his rounds. We stayed even with him for at least four minutes, which only goes to show how much land he has to cover in one day. The seat of Fisher County was only a few more miles past that. 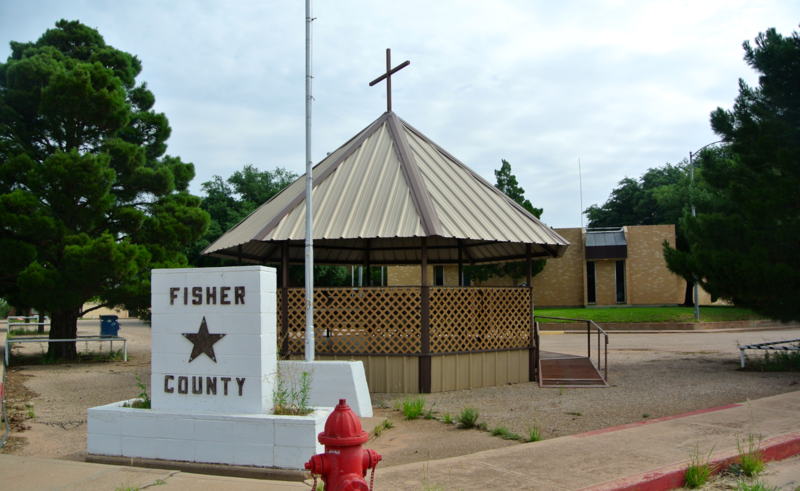 This was the first new courthouse of the day, making Fisher County #209. The downtown square is certainly dried up, but it’s got a sort of charm to it. The courthouse, however, is not as “pleasant”, especially when one compares it to Jones County’s “next door”. Now realizing that all the courthouses I’d see today would be closed, I was pleased to find an open courtyard on the building’s eastern side that gave me access to the closest thing to interior shots I’d be getting. Also to my luck, I came across a historic cornerstone. The 1910 courthouse was replaced (of course) in the 70s, but the story goes that it was split in half and turned into two residences. 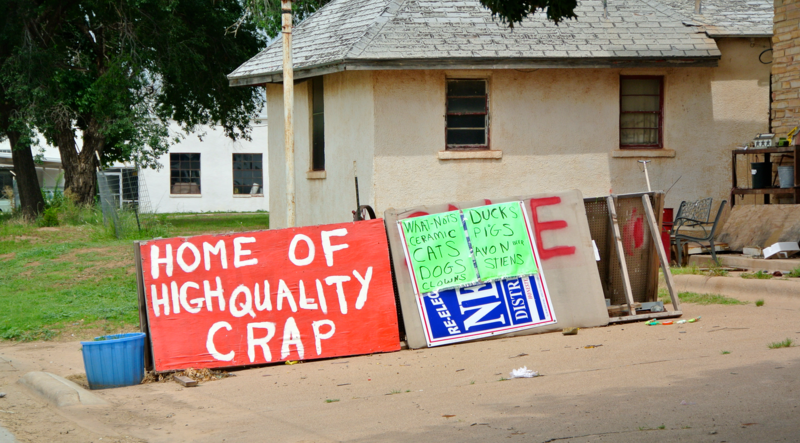 I didn’t see any homes that resembled a courthouse while in Roby, but I probably didn’t look hard enough. A gazebo on the corner of the courthouse property was donated by local residents. I quite liked it. So off we went west again (after exploring Roby for a few minutes). 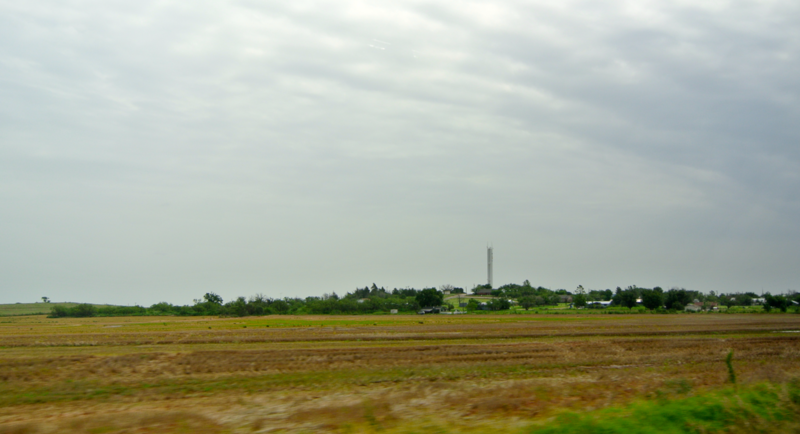 We were heading deeper into a series of great, windswept plains. One hundred and forty years ago, these were thick with massive bison herds, and Comanche and Kiowa tribes (and eventually American poachers) following close behind them. Snyder, the next county seat on our journey, was started as a trading post for buffalo hunters. This is the ultimate definition of roadside America. This is the kind of americana that you find on the covers of “Wacky USA” and other side-show, road-trip attraction books. It’s very neat. 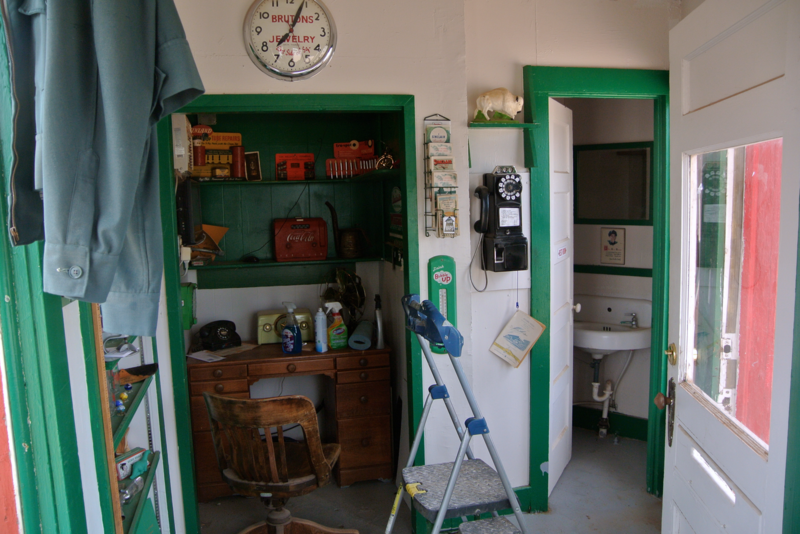 The interior is very small, but it’s decked out with all sorts of Sinclair memorabilia, historic photos, and information to be viewed through the window. I tried the door, but it didn’t budge. So to get a shot or two of the inside, I leaned up against it, pressing the camera lens up to the glass and the hinge swung open. I was surprised, and didn’t feel like passing the opportunity up. Not knowing whether or not I would get chastised for stepping inside, I quickly moved to take a photo. I got one, and began to start for another, when a small alarm began beeping. You can bet I got out of there quickly! The courthouse was next, and as we rolled up into the Snyder square, I realized that the Sinclair station had more architectural character than what they’ve named the courthouse here. 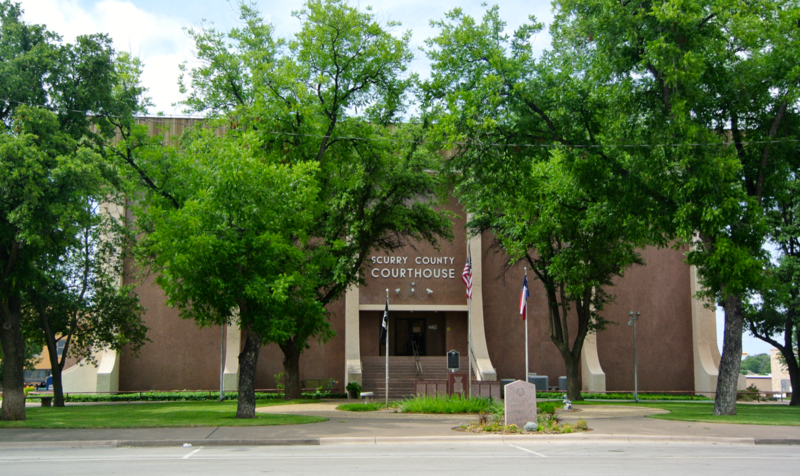 What I’d call the Scurry County courthouse is certainly a “creation”, but in this sense, I use the word creation the same way Mary Shelley would use it to describe Frankenstein’s Monster. It didn’t always look this way. A historical display on the courthouse lawn detailed facts about the original building, dating from 1911. It had a dome and tower, and actually looked more like the Jones County courthouse in Anson. An unfortunate remodel in 1950 called for the removal of the roof ornamentation (that being the dome and tower), and an even more extensive modernization occurred twenty-three years later in 1973. In the spirit of a style called Brutalism (for good reason! 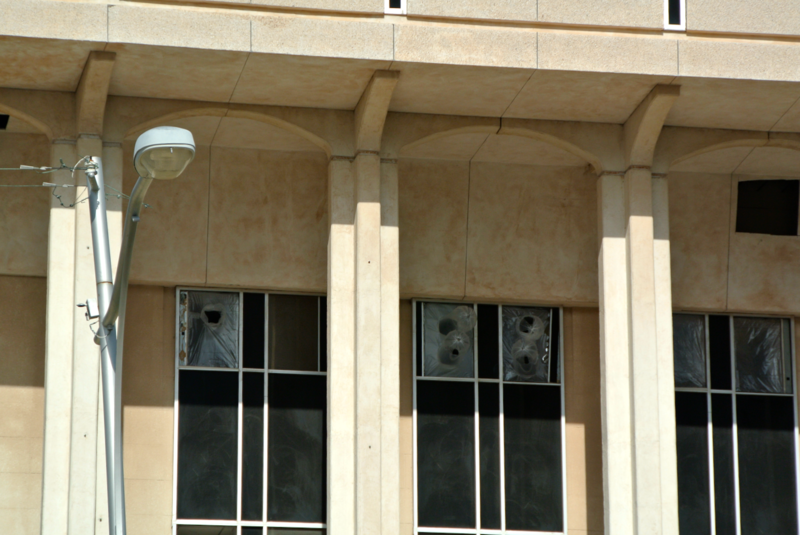 ), the courthouse was encased in a modern shell of granite. What can I say? 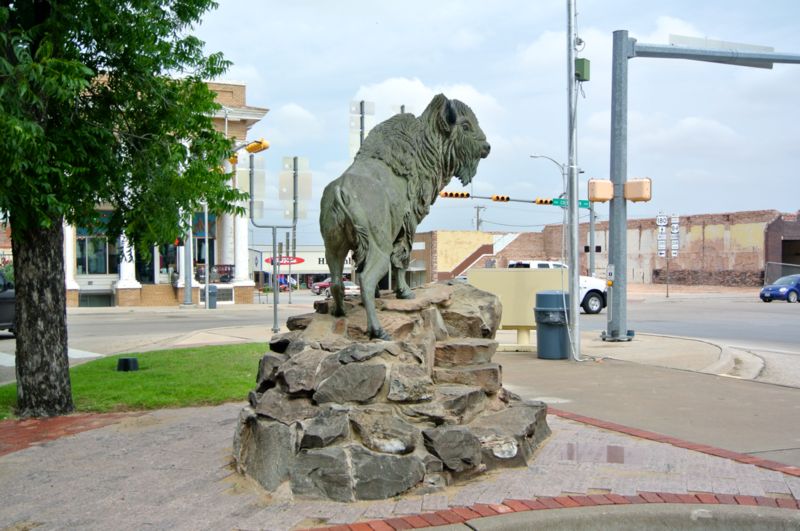 On one corner of the courthouse property is a statue of Snyder’s town mascot, the white buffalo. The story goes that J. Wright Mooar, a renowned buffalo hunter, was camped about ten miles northwest of what is now town in 1876 and shot a rare, albino bison. 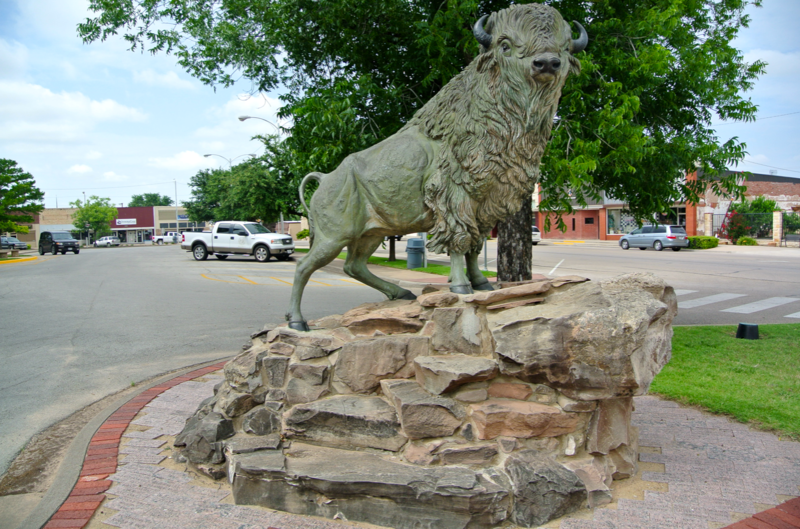 To the Comanches of this region, the “white buffalo” was considered sacred. 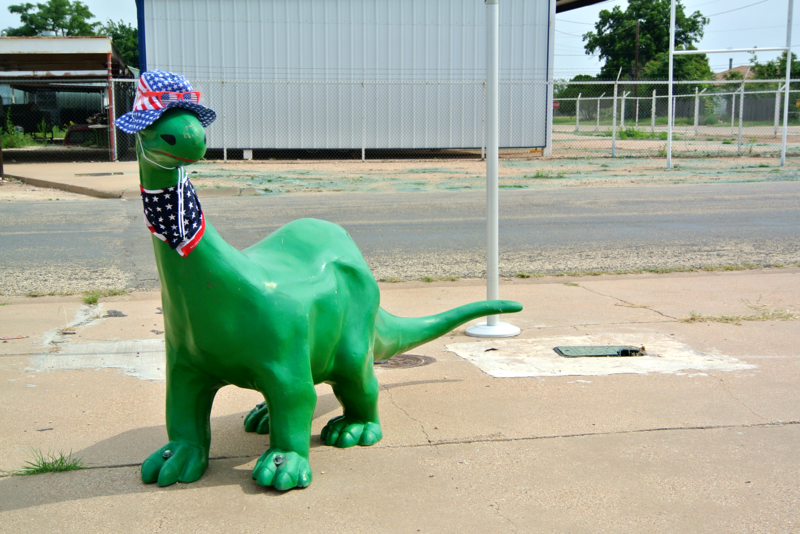 Two years later, when Snyder was founded, locals adopted it as a sort of mascot. However, today, the school district uses “the tigers” instead. Counterintuitive, if you ask me. 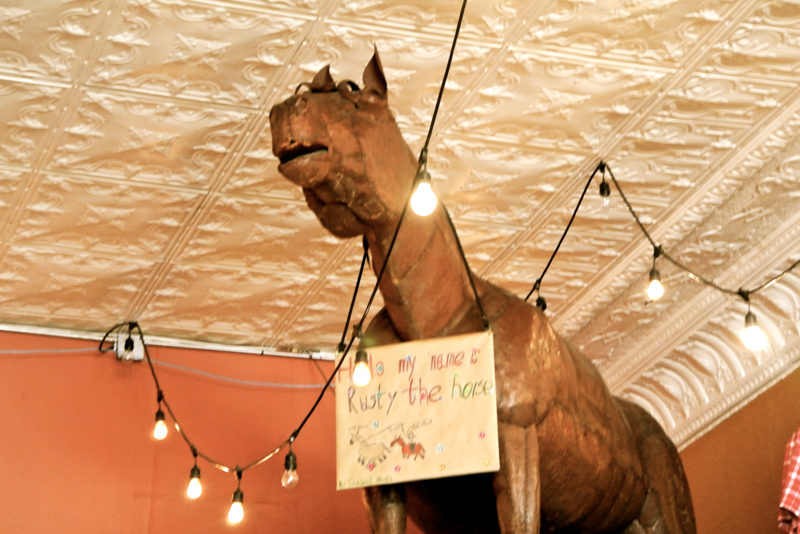 We had lunch on the Synder square, in a small joint called “Big Apple Deli”. We found while we ate that we were being watched by Rusty. 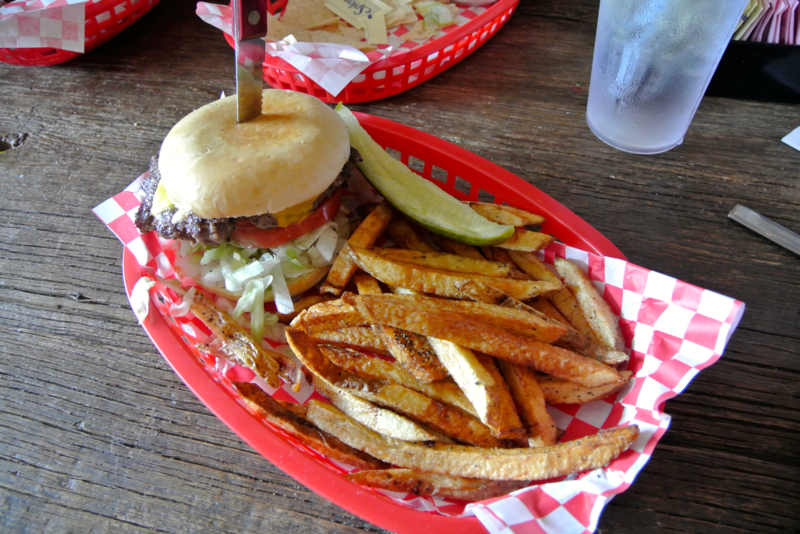 The hamburger here was fantastic and was sufficiently filling for us to head back out on the road. Aside from the courthouse, I can’t say that this is true of Snyder. The people here were very nice! Between Roby and Snyder, we encountered our first wind turbines of the trip. 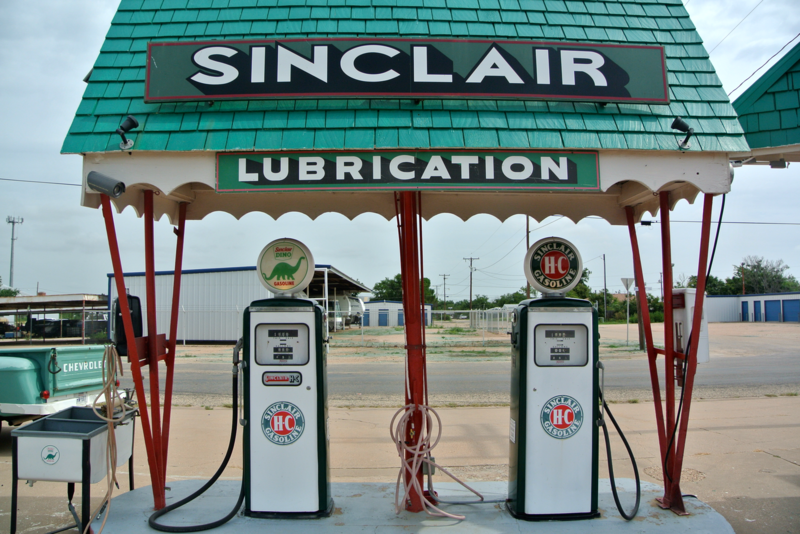 Yet, between Snyder and the countryside of adjacent Borden County, we came across our first pump jacks. 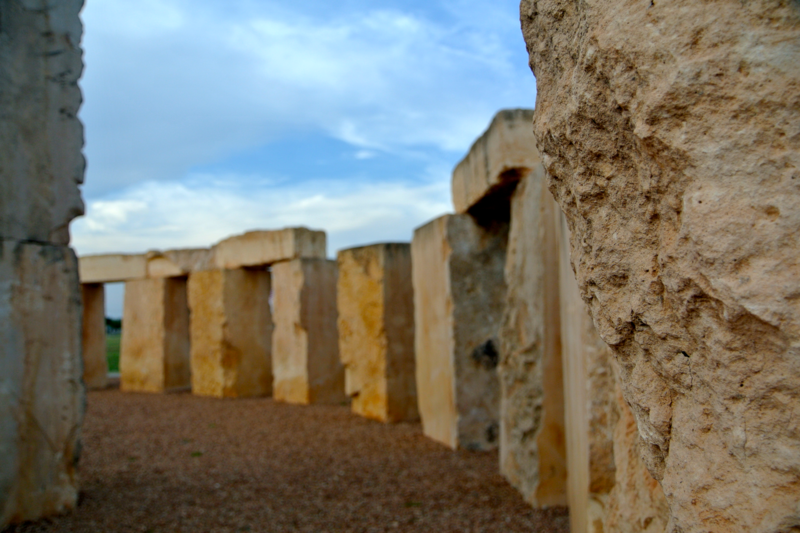 West Texas is chock-full of geographic features, but most all are naturally occurring. In my book, wind turbines and pump jacks are just as plentiful to be called such. No landscape in this region would be complete without one, the other, or in some cases: both. 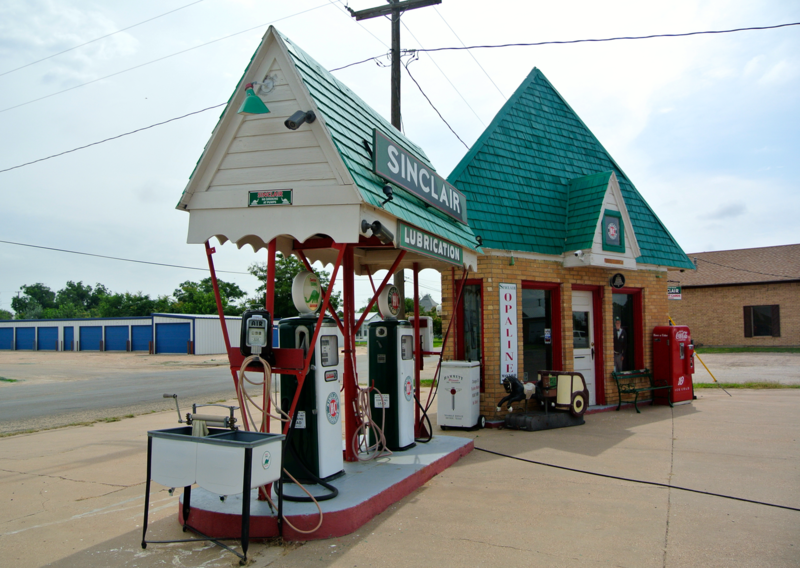 Snyder rests at the base of the Llano Estacado, a massive plateau that stretches across the western portion of the state, from as far north as Amarillo to as far south as the Midland/Odessa region. The area is recognized easily by the mountainous rises and mesa-like ridges that begin appearing in the distance of normally flat prairie. 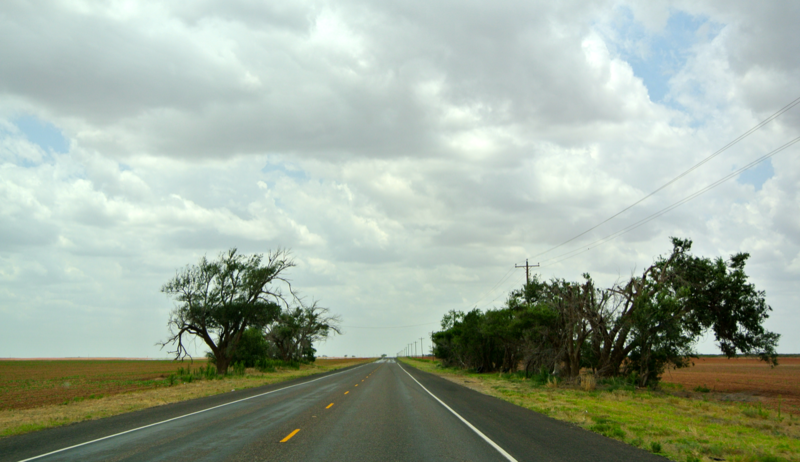 I spotted the edge of the Llano as we traversed the mesquite-filled plains of Borden County. 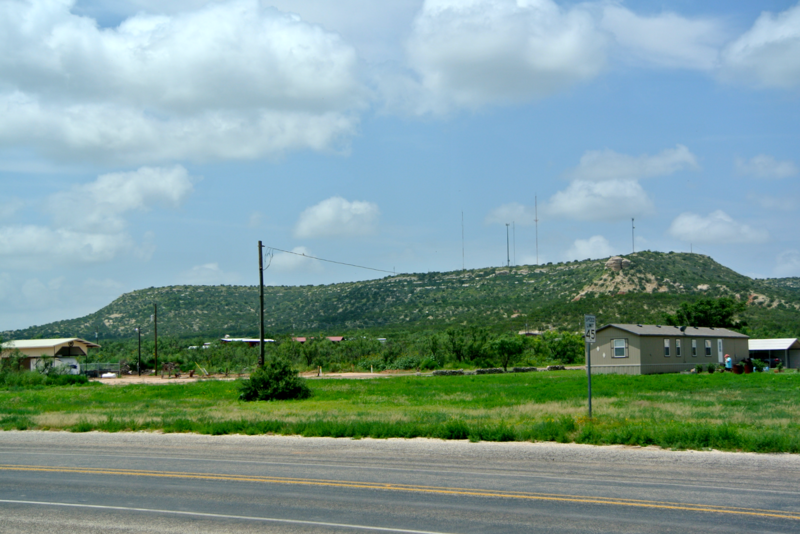 The county seat, a minuscule community called Gail, lies at the base of one of these “Texas mountains” (large for us, but anthills for Coloradans). I’ve been to some small county seats, but this is one of the tiniest (outside Lipscomb, Mentone, etc.) 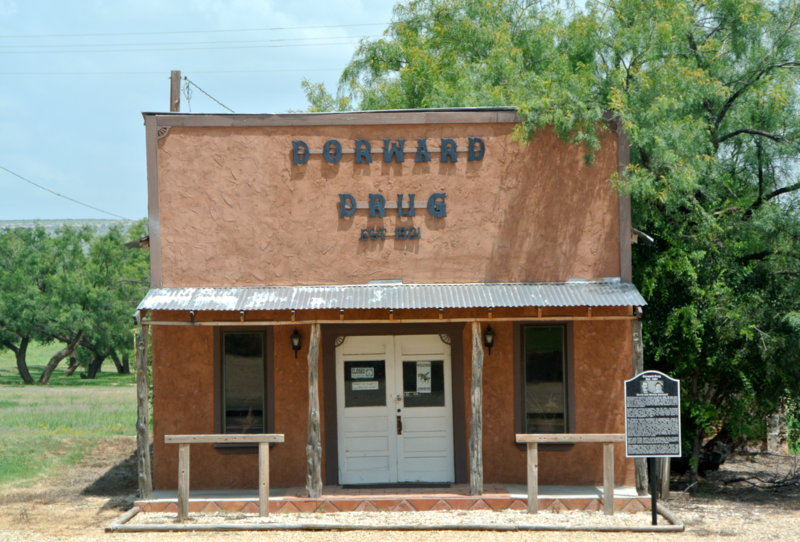 The courthouse sits right on the highway, as does a slew of abandoned buildings, including a pharmacy from days gone by. 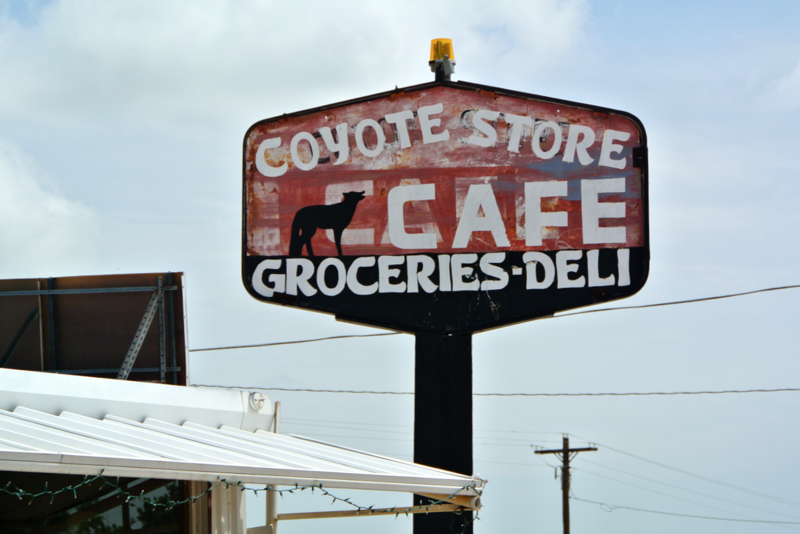 The Coyote Country Store and Cafe was where “all the buzz was” when we arrived. It was the only place with a bunch of cars parked out in front. It was too bad we had just had lunch, because I’m sure the food would have tasted great. In fact, while I set out photographing the courthouse (diagonally across the lazy highway from the cafe), my grandmother sat down and tried a bite of coconut pie. She said it was great, but I can only take her word for it. The courthouse is only a one story, but wasn’t built in the 70s/80s. 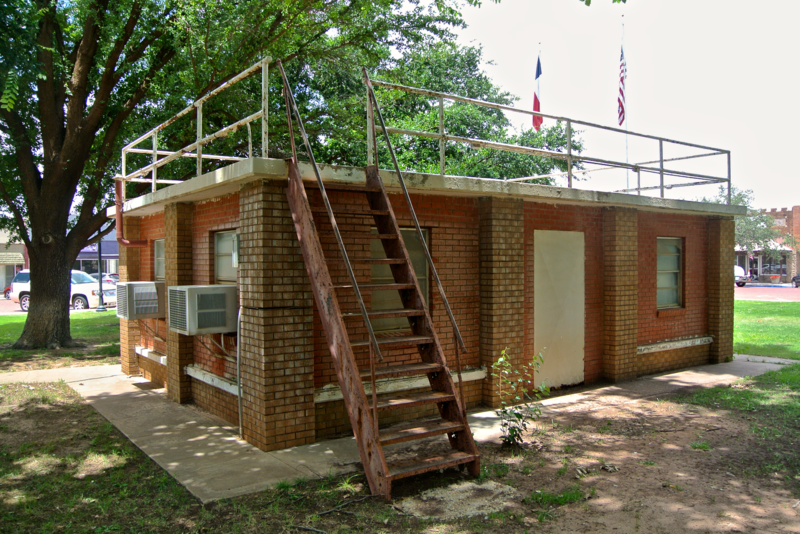 I’ve seen ground-floor-only versions before, but they’ve all been the post-Moderne, modern “metal shacks”, like Baylor, Morris, and Zavala Counties. 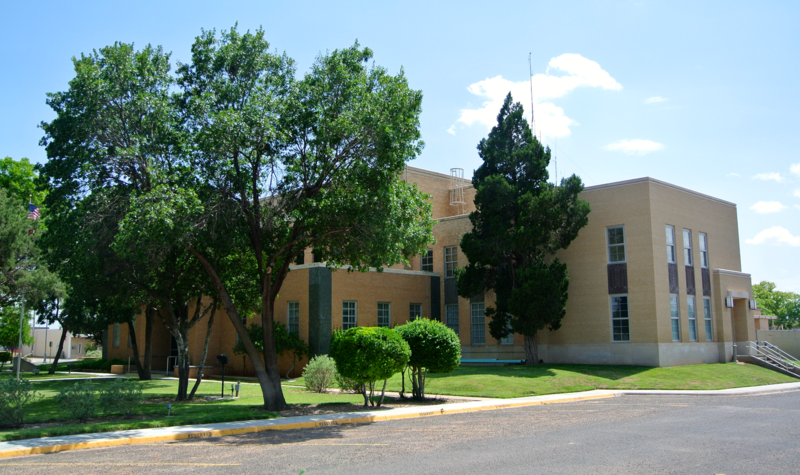 The Borden County courthouse, constructed in 1939, is the oldest one-story courthouse I’ve seen. In its day, it wasn’t common to stop building at one floor, so this is obviously intriguing. I was blown away with the stillness of Gail. Yes, there is some traffic that comes down the main highway, but you can hear the cars coming before you see them. Their sounds penetrate what is normally empty aside from the hoots of local doves and the wind through the trees. One feels truly “in the middle of nowhere” while in Gail, or at least I did. 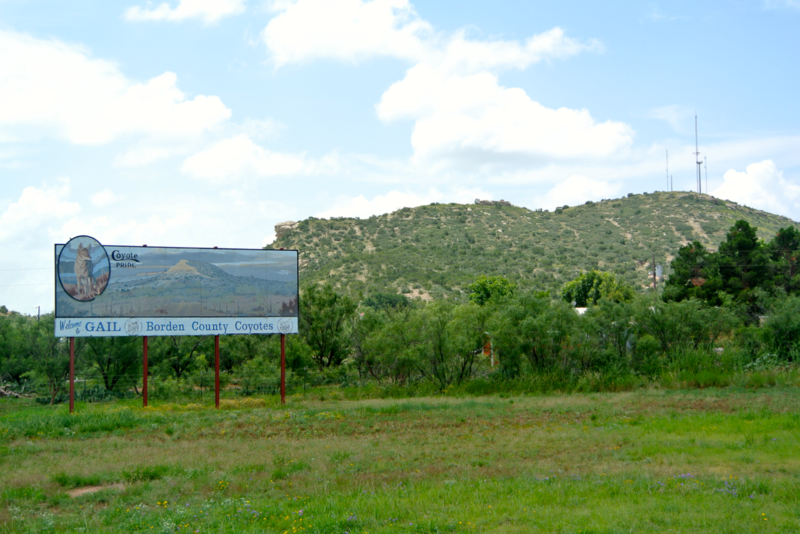 The rolling plains and mountain visible from the courthouse steps only add to this experience. You know it’s hot when! As we left Gail, and began trekking up the rise towards the Llano Estacado, I fumbled for the cover to my camera lens (which is attached to a cord that is in turn attached to my camera strap), and didn’t find it. The cord was there, but the cover had been torn free. I’d dropped it back at the courthouse! We turned back around, but things didn’t look great. In retrospect, it was a “needle in a haystack” kind of situation when it came to my changes of finding it, but I didn’t think about that at the time. To me, the possibility of finding it was very real. All I had to do was retrace my steps. That’s exactly what I did, and in no more than three minutes, I’d found it out behind the courthouse, near the entrance to the adjacent Agrilife Building. My only obstacle in finding it had been the relentless barking of a dog in a nearby backyard, but that didn’t get in the way much. This time, we headed out of Gail for good, but not before stopping at the city sign for a picture. The mascot here is the Coyote. Up the Llano we climbed next, emerging from the staked plains below to a series of completely flat, and fertile, fields that marched on to the horizon. They were growing cotton here, amid other things. 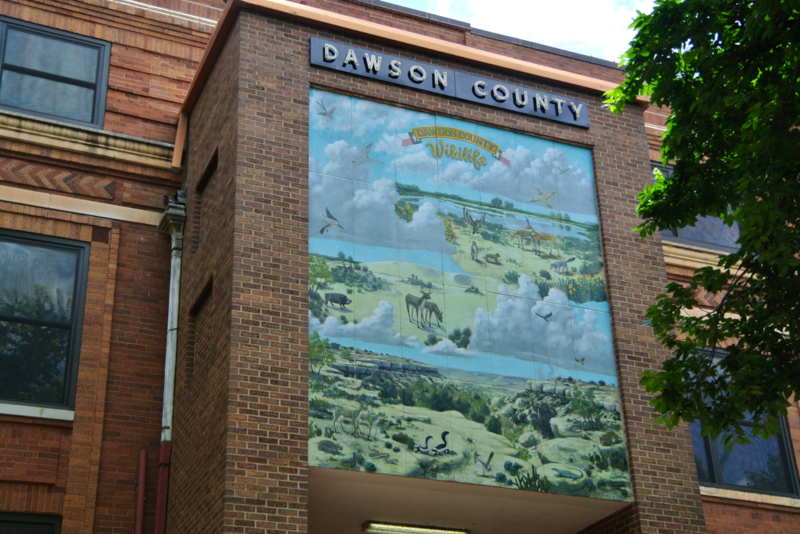 This flat land is notorious enough to have inspired Dawson County pioneers in naming their county seat. 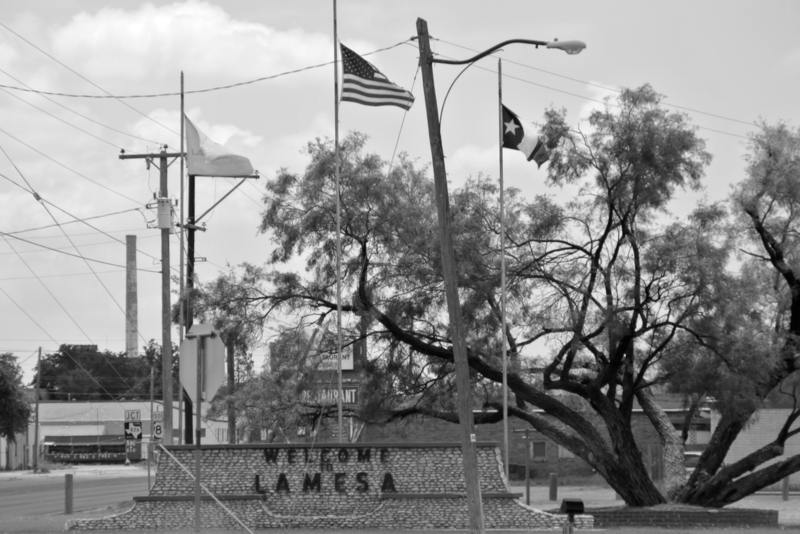 Lamesa, pronounced “lameesa” is the combining of “La Mesa” (after the geographic feature), which in turn means “the table” in Spanish. The ground is certainly flat enough to be mistaken for an enormous tabletop. 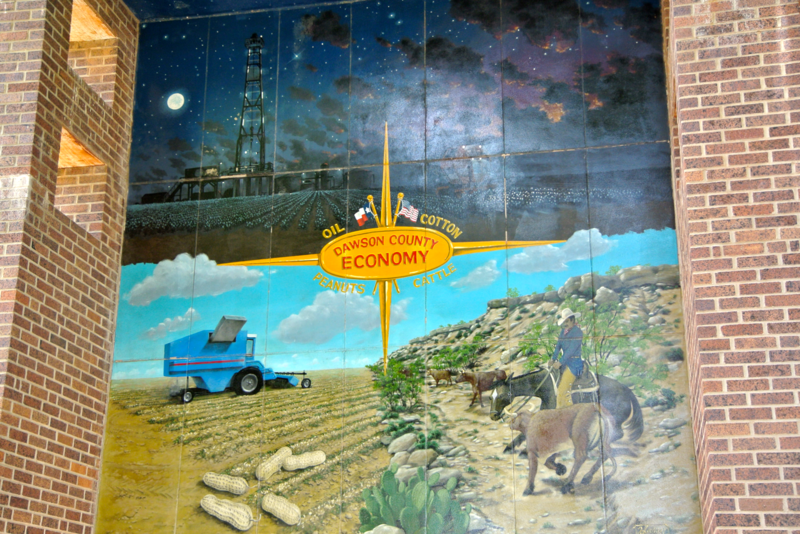 As a courthouse mural described, Dawson County’s economy is based on four factors: oil, cotton, cattle, and peanuts. I didn’t realize until having already passed through the Dawson County countryside and farmland, that some of those crops I’d seen may have been peanuts. The courthouse here dates from 1916. 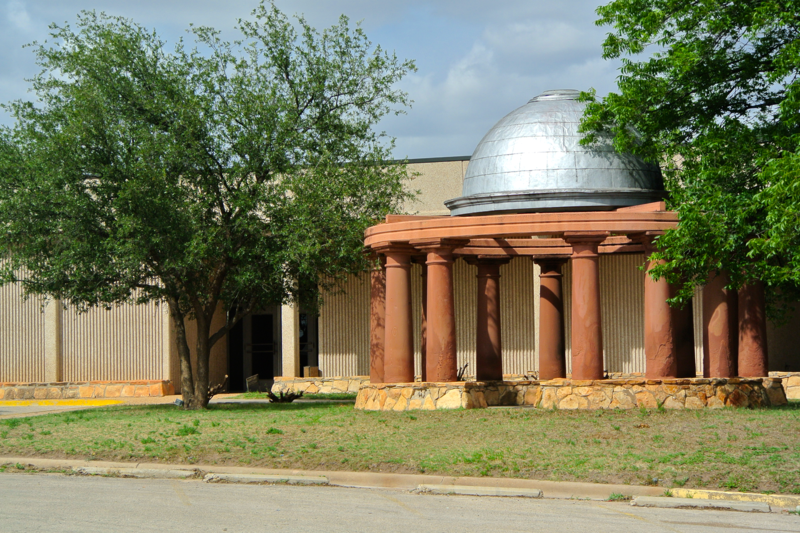 Originally, it looked the part of the Texas Renaissance Style with classical elements vaguely similar to those in Freestone and Dallam Counties, and more particularly similar to Lynn County’s in Tahoka (only a county north). 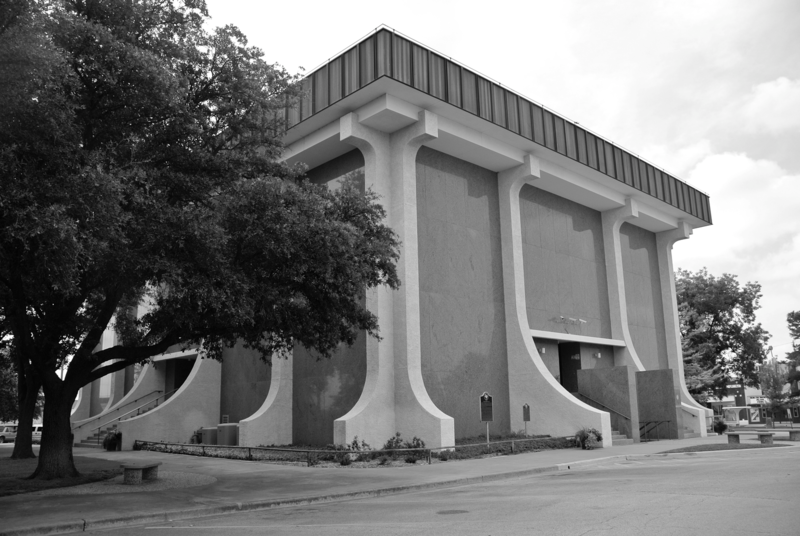 However, a heinous remodel in 1952 saw the advent of an annex and a modernization that turned the courthouse into something the likes of which I’ve never seen. It’s a very strange design that becomes only stranger by the large local artist’s murals on each side. 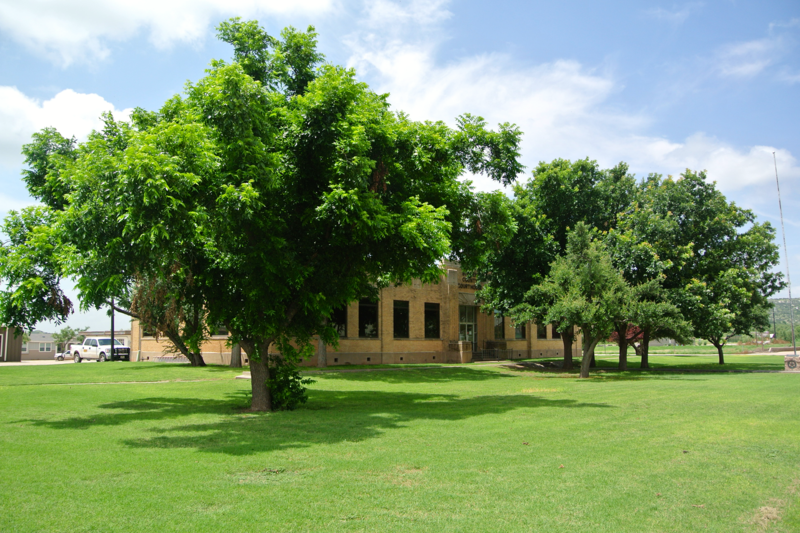 To make matters worse, the grounds are covered by bird mess, there are eyesores in the form of AC units and other utilities hogging one entire side, rust and mold cover corners and waterspouts, and the square itself is “dying” in places. A decrepit building with more old AC units sat near one of the corners and did nothing to remedy the depressive look of the area. However, a ladder to its roof gave me a semi-areal shot of the courthouse (which I’ve never had before). I did admire the city’s attempts at making downtown more of an enticing place to visit, though. A public plaza and country music-playing loud speakers positioned at buildings on each corner gave it a nice atmosphere. Gene Watson’s “Fourteen Carat Mind” and Johnny Cash’s “Ring of Fire” were two of the samplings I heard while touring the grounds. 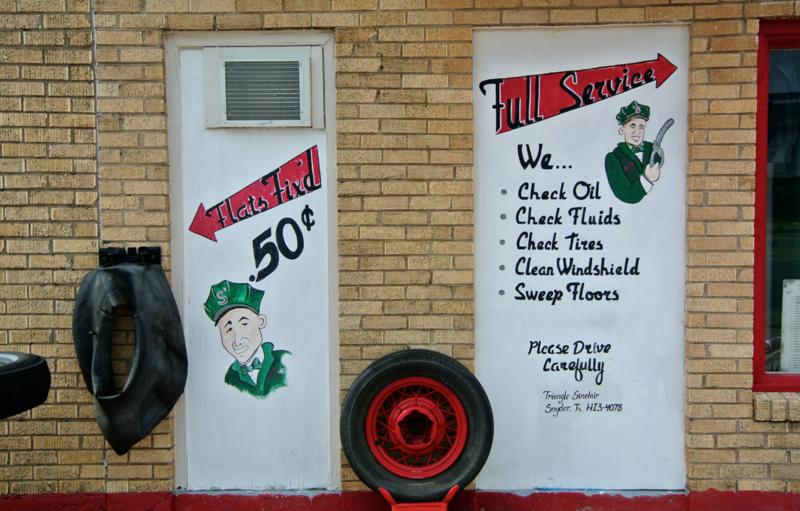 In the country music world particular, this area’s claim to fame is the fostering of singer Tanya Tucker. 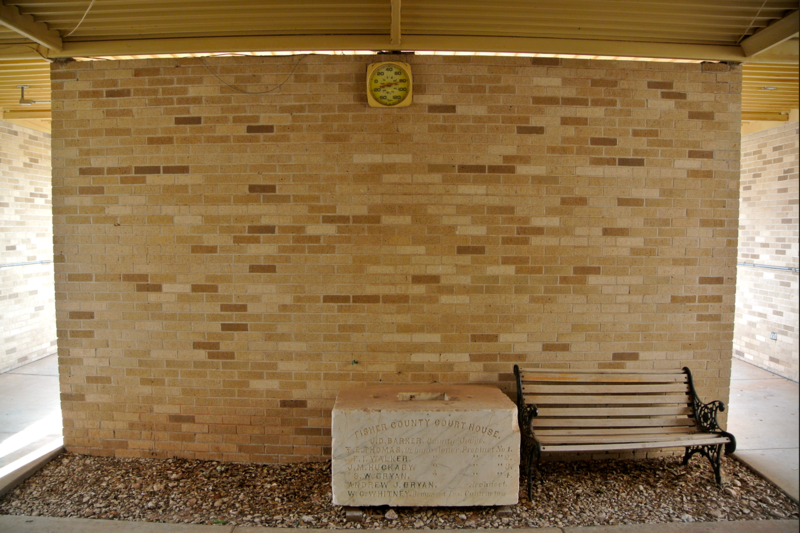 She was born just down the road from Lamesa in Seminole, seat of Gaines County and my next stop. As far as Texas goes, Seminole’s at “the end of the line”. 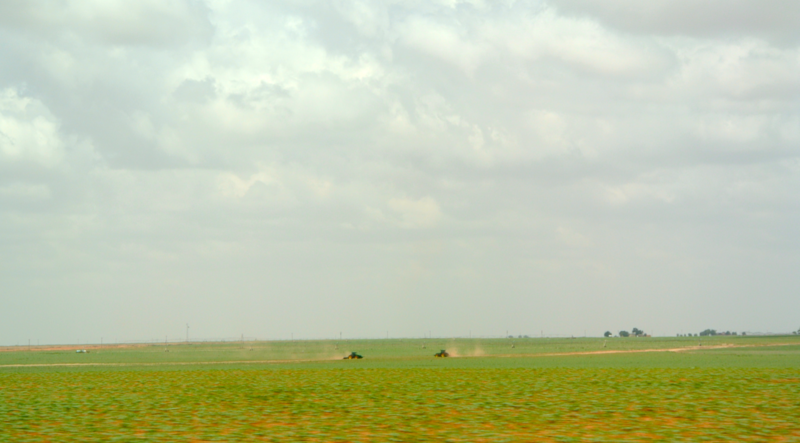 Gaines County’s western edge shares a border with New Mexico, and the plains here are as flat as they come. 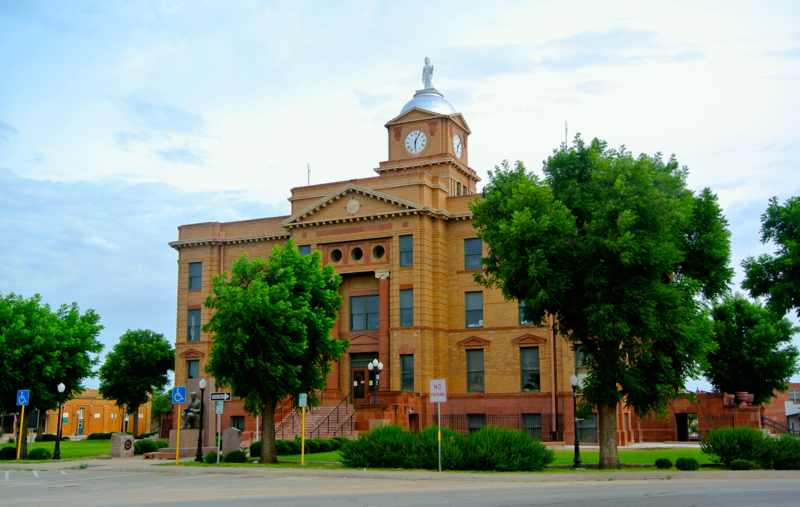 Seminole and the area around it follow all sorts of general, regional patterns: flat plains, big skies, farms and pump jacks dotting the countryside, and ugly courthouses sitting on the square. Designed by the same folks who took on the original Dawson County courthouse, this one was finished in 1919. Just like the fate of Lamesa’s version, it too underwent a drastic, modernizing renovation that overhauled the Texas Renaissance and older style elements with a shell of concrete. That happened in 1955. What was wrong with architects then? No, it’s not the worst to be seen…but it’s nothing to write home about. Needless to say, I didn’t spent too much time in Seminole. 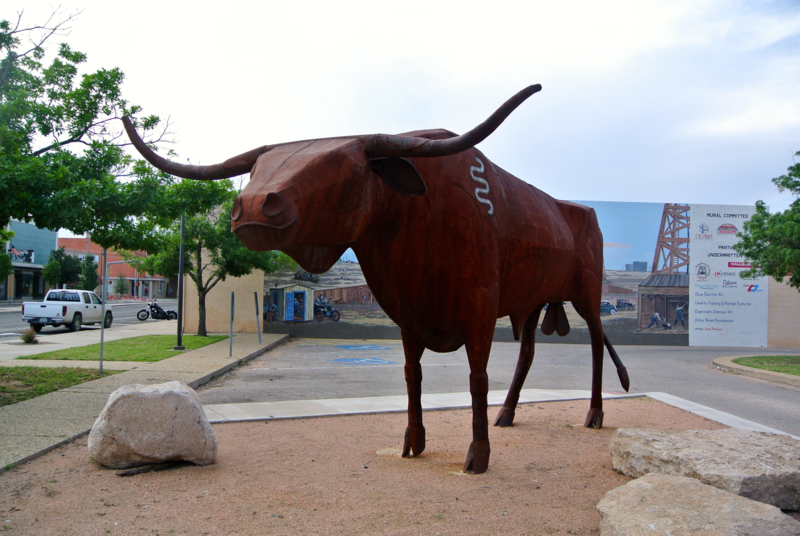 Rather than head west into New Meixco (though I did have a yearning to go revisit Santa Fe), we turned south from Gaines County to head deeper into the oil-rich Permian Basin. 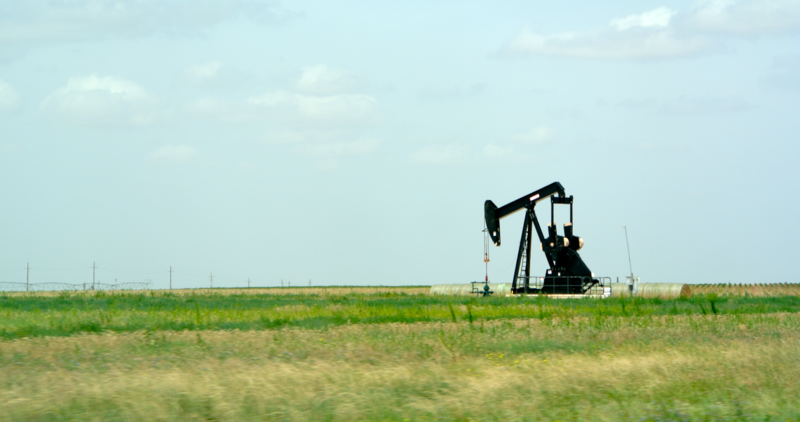 Pump jacks increased in prevalence, and the terrain grew harsher. We were transitioning into Andrews County. #114. 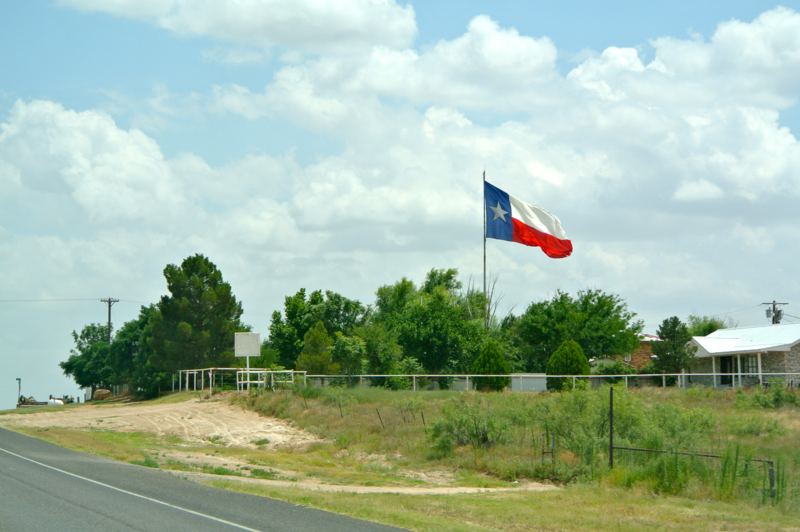 During the drive, I spotted a Texas flag that, as we got closer, got bigger and bigger. By the time we passed it, I realized just how big it was. I’ve never seen one so large! This was a clear reminder of the American flag (of about the same size) that I found on the Gilmer square in Upshur County last summer. 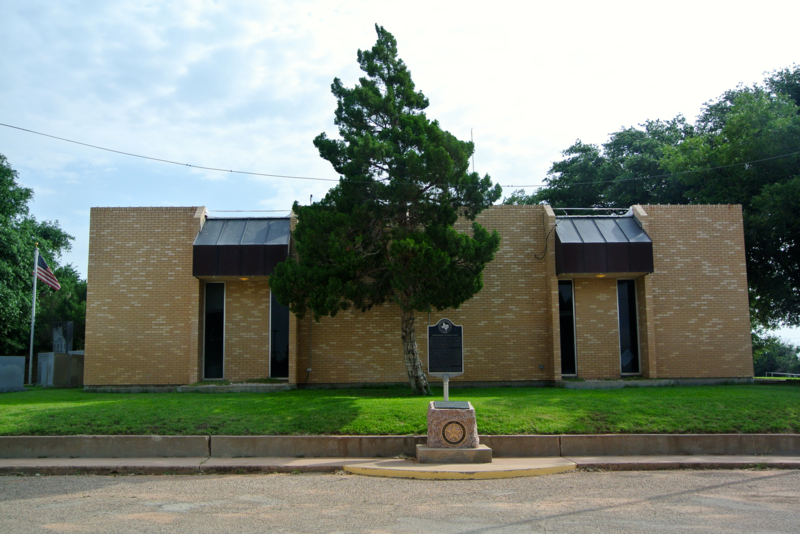 The Andrews County courthouse is another modern building, located just off of the highway. The main entrance is well shaded, a thankful respite for photographers who have spent a great deal of the day under the hot, West Texas sun. Beneath the tree, I found a few unique features. 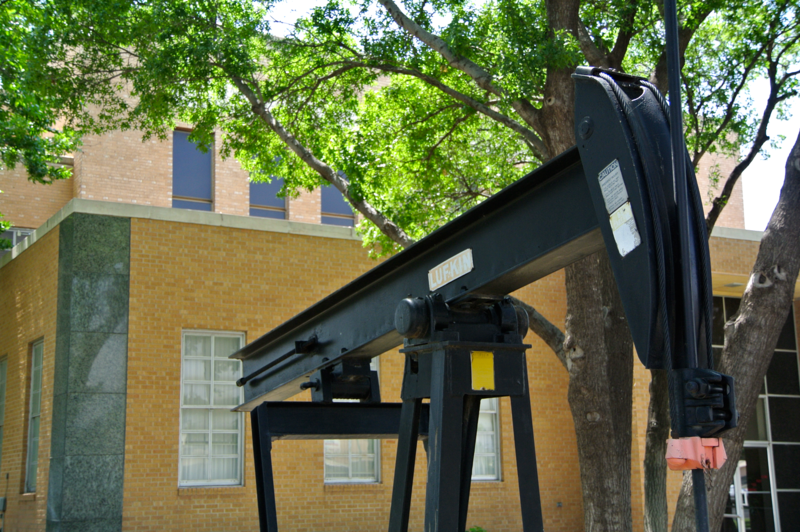 The first was a small pump jack. 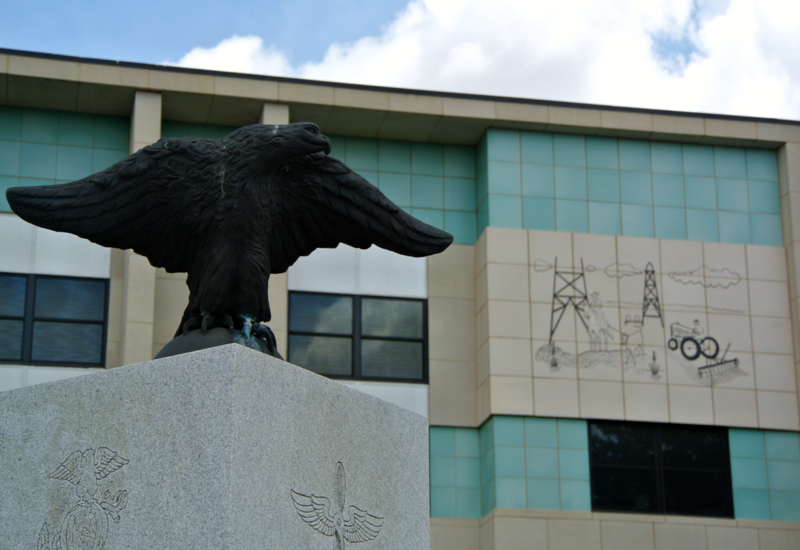 Donated by the Ruthco Company, it’s there to memorialize the county’s oil industry. 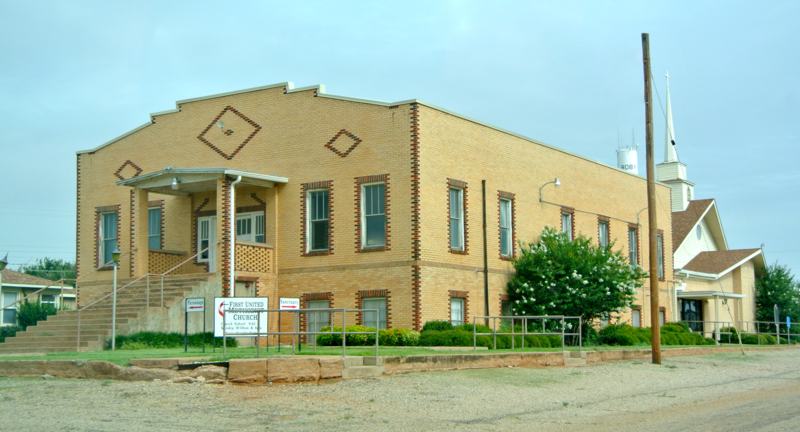 In Andrews County specifically, two billion barrels of crude oil were produced in a fifty-two year period from 1929 to 1981. 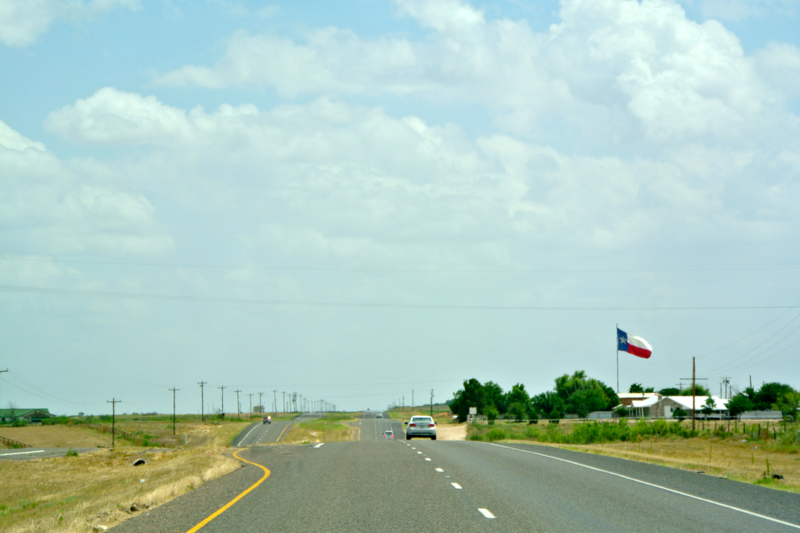 They were the third county in the state of Texas to have made it past the 2B mark. The industry is still important to the economy and people of Andrews County, and this jack on the square is a reminder of that. I also discovered a grave on the square, but it’s not for a person. Pinto was a K-9 unit from the Andrews Sheriff’s Office. When I had completed my time with Andrews, we took off east through the countryside once more. Gas wells, barren plains, the highway, and of course, pump jacks are the collective sum of most everything one can see traversing this area. 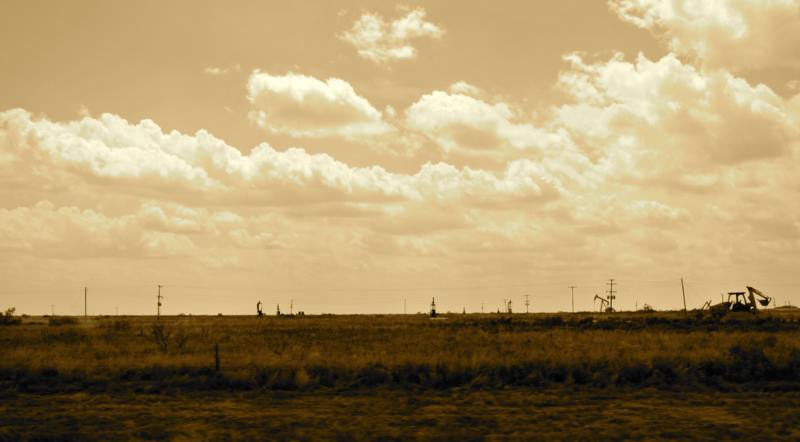 This is the heart of the Permian Basin, oil country. Along the way to our next stop, we passed through the tiny town of Tarzan. I’d be curious to know the origin of the name, as I certainly didn’t see any jungle men swinging from vine to vine. 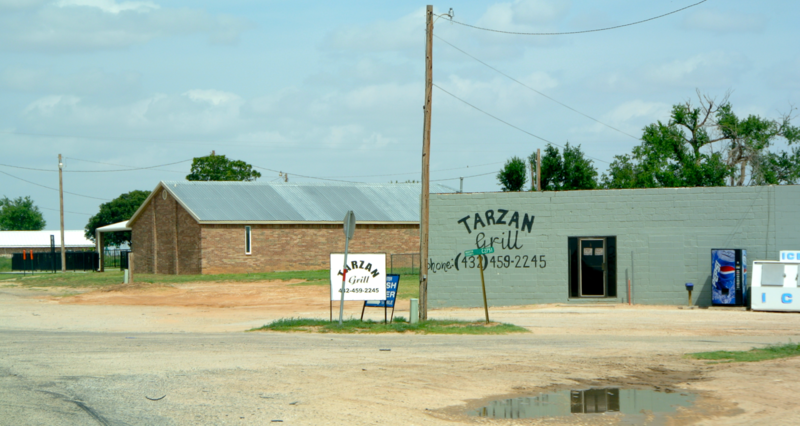 There’s no vines, nor jungles, nor hardly any trees to be found in Tarzan, Texas. Martin County was next. The seat, Stanton, was fairly quiet by the time I arrived around five o’clock. The historic downtown advertised an Old Settlers Reunion as we drove through. 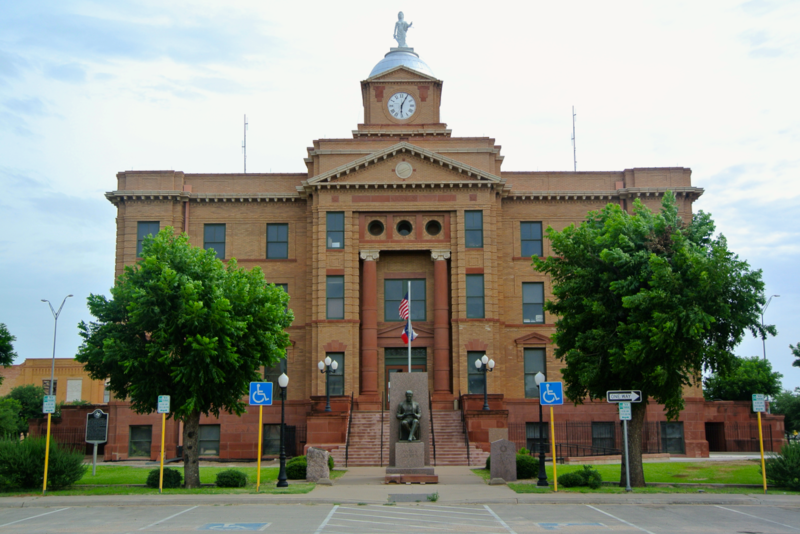 Old Settlers to the Stanton area would remember the 1908 courthouse, which survived 1950s modernization, only to be razed in the mid-70s. The Martin County courthouse that stands today is nothing to be proud of, an empty void of absent ornamentation, no windows, and plain, brown walls. It fits in well with the likes of Morris County’s in Daingerfield. You may remember, that even though Morris County now uses a “metal box”, they preserved a piece of courthouse history by deciding to not raze their past building. It still stands in Dangerfield, those it’s used as a law office. Unfortunately, Martin County was not as considerate. 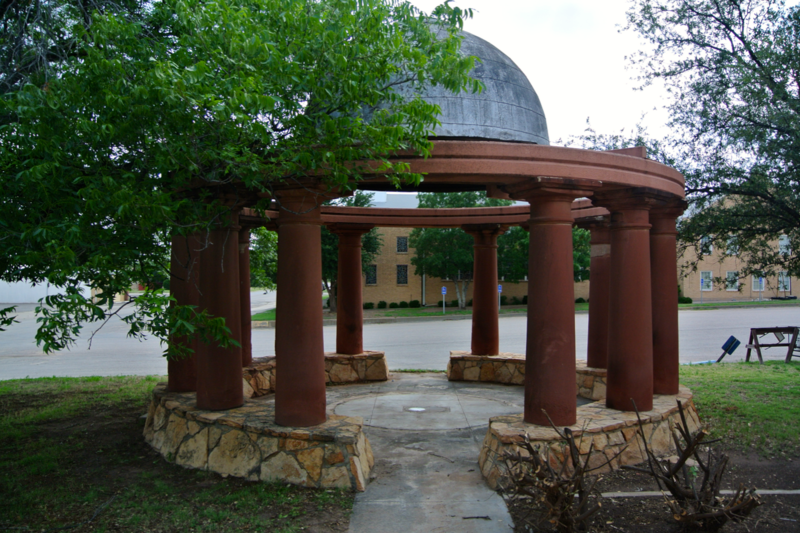 Though, to their credit, the county residents have created a gazebo on the courthouse lawn constructed out of twelve columns and a dome salvaged from the 1908 building. 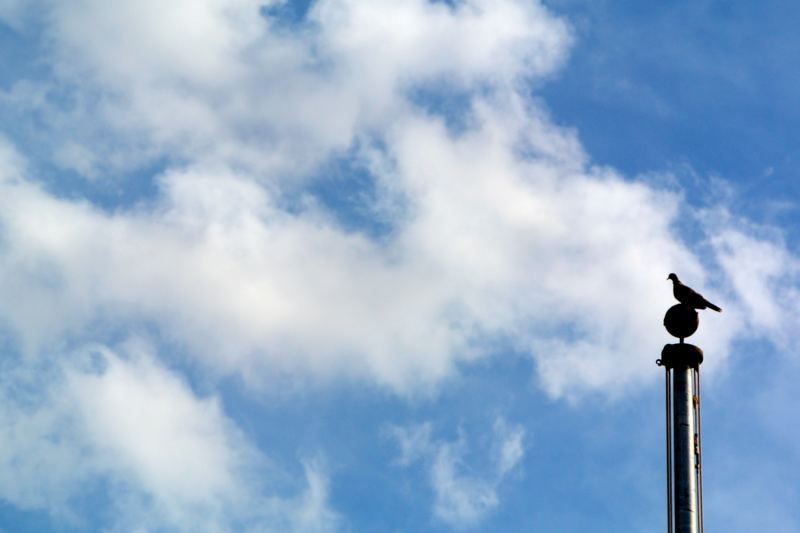 While photographing the building, my grandfather pointed to the flagpole. At first, I didn’t understand what he meant, but then I spotted a dove, sitting right at the top like he owned the place. He was just one of many milling around the courthouse grounds. 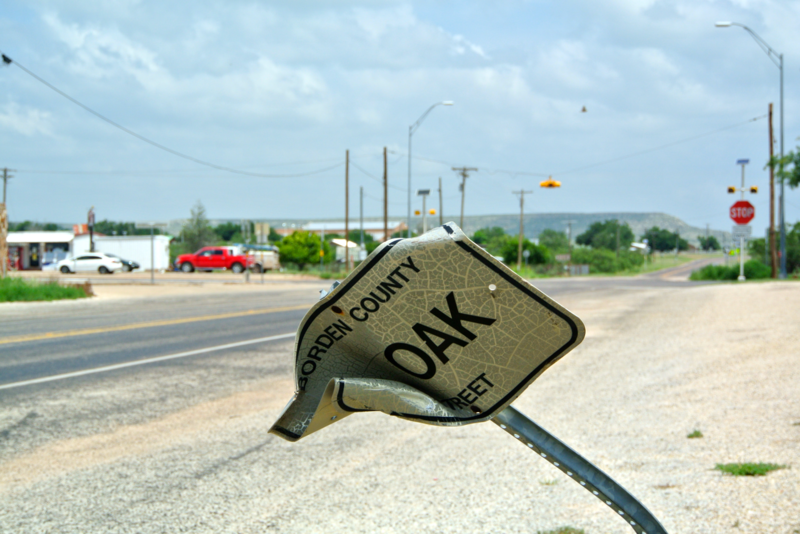 Flocks of doves are all over the place here; their hoots can be heard at nearly all times while walking through the towns of the Permian Basin. 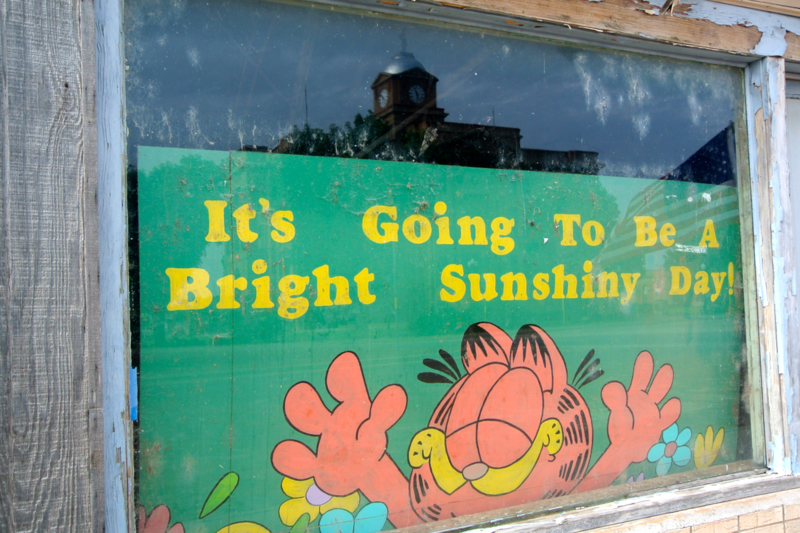 Well, in the country towns that’s true, anyway. In the big cities, automobile traffic is the more popular sound. 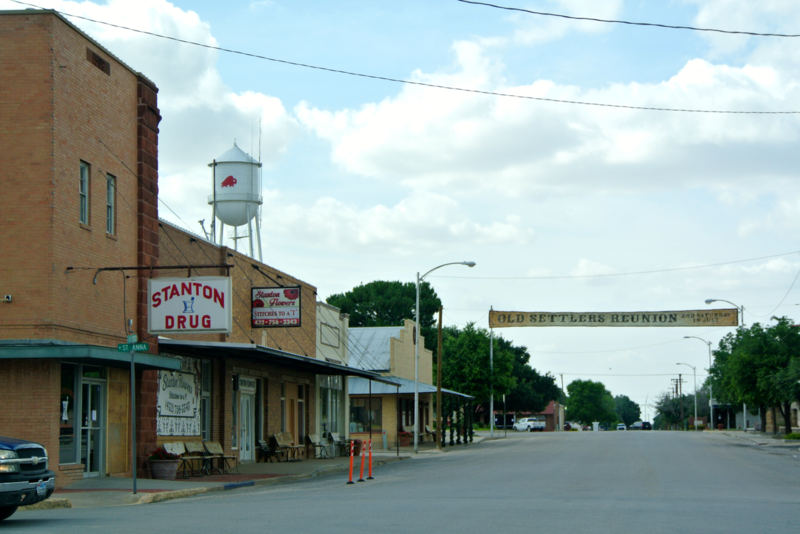 After leaving Stanton, we transitioned from the country into the city with a move into Midland County for #216. 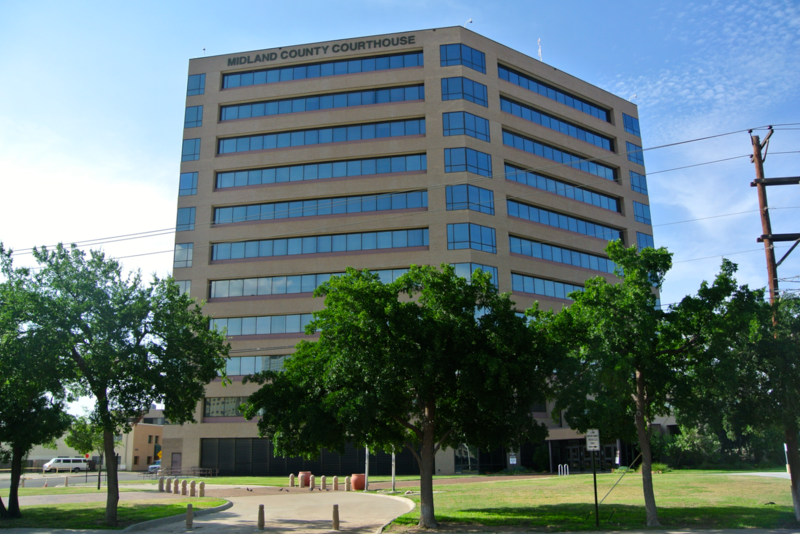 I’d never been to Midland, but had always been curious to visit. The downtown scene is bigger than I imagined. 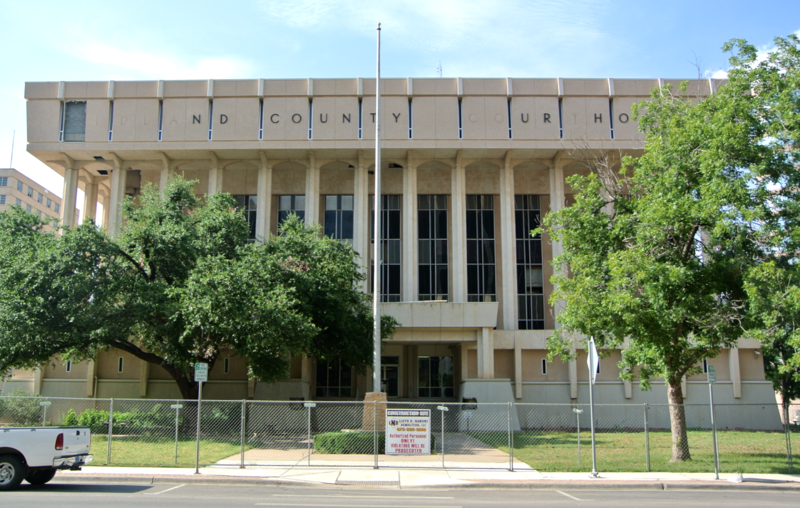 The Midland County courthouse, constructed in 1930 and modernized in 1974, was abandoned in 2010 (I quickly learned). That year, a much larger and much taller building was developed to serve a large population. It’s four blocks to the north of the older one. 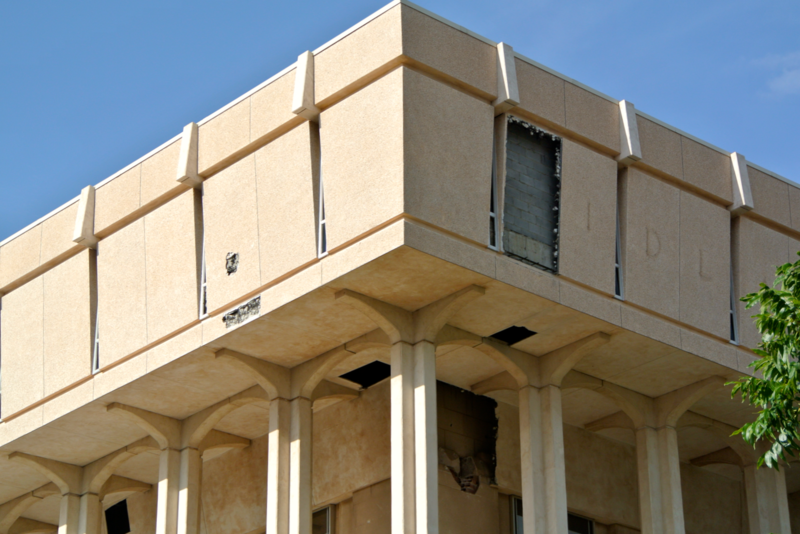 Now, rather than put the building through rehabilitation, the county has elected to demolish it. And, that process is underway. I was of course reminded of the similar situation in Nueces County, where I’d been only two weeks prior. In Corpus Christi, the county can’t demolish their historic courthouse until 2027 due to a stipulation in state granted funds. Unfortunately, no such clause seems to exist in Midland. 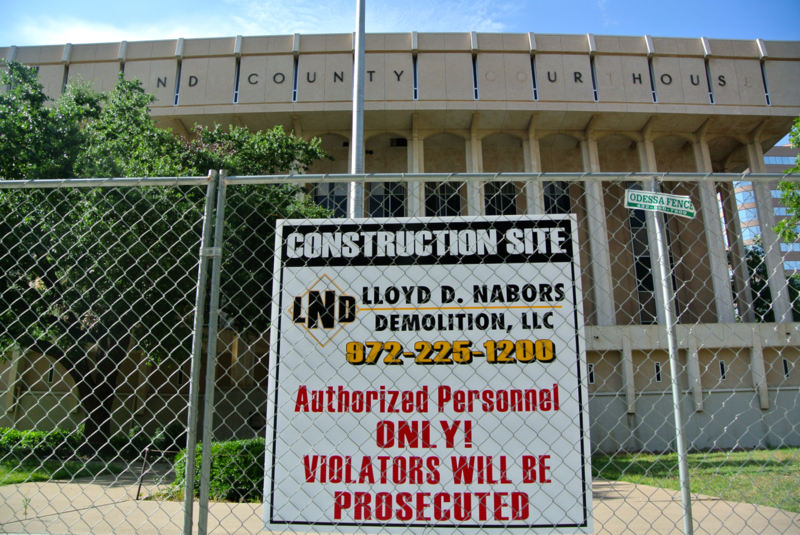 I arrived to see the beginning of the end for the Midland County courthouse. I worked with what I could to capture this building (from the other side of the fence), and moved on to take a couple of the newer courthouse as well. It’s a fine building, but there’s nothing that differentiates it from your average downtown skyscraper. I prefer the original. 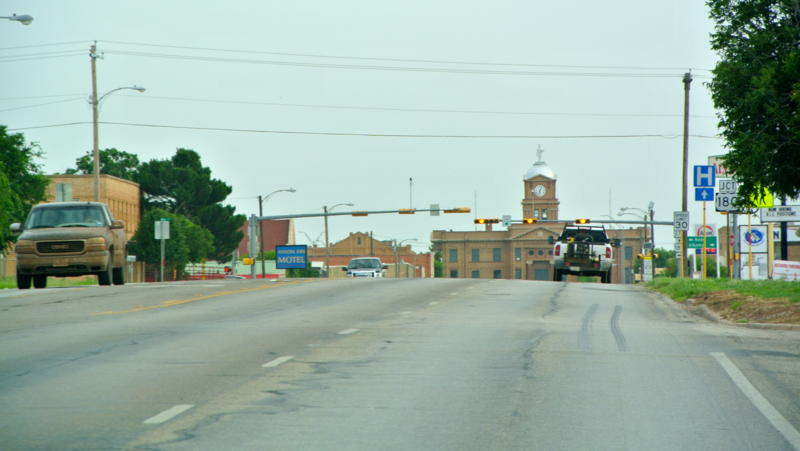 Once I’d completed my work with downtown Midland, we headed south to rejoin Interstate 20, and headed west to its sister city Odessa, seat of Ector County. 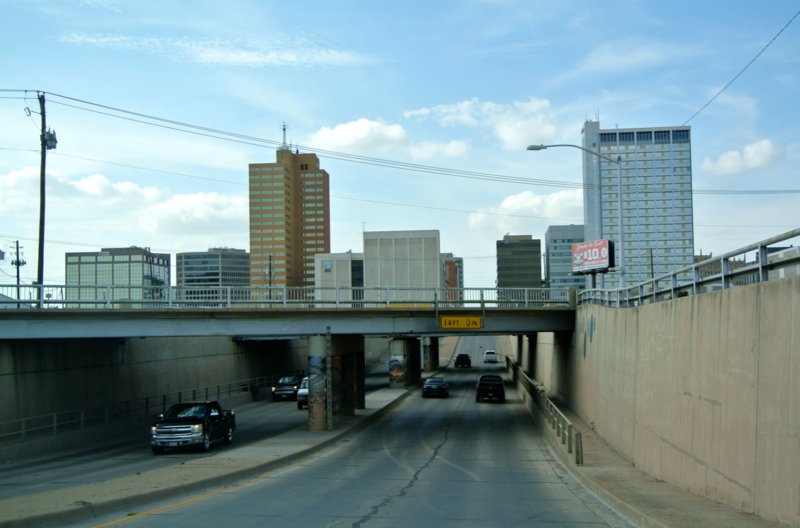 Back home, the local vernacular word for Dallas and Fort Worth is the “Metroplex”. 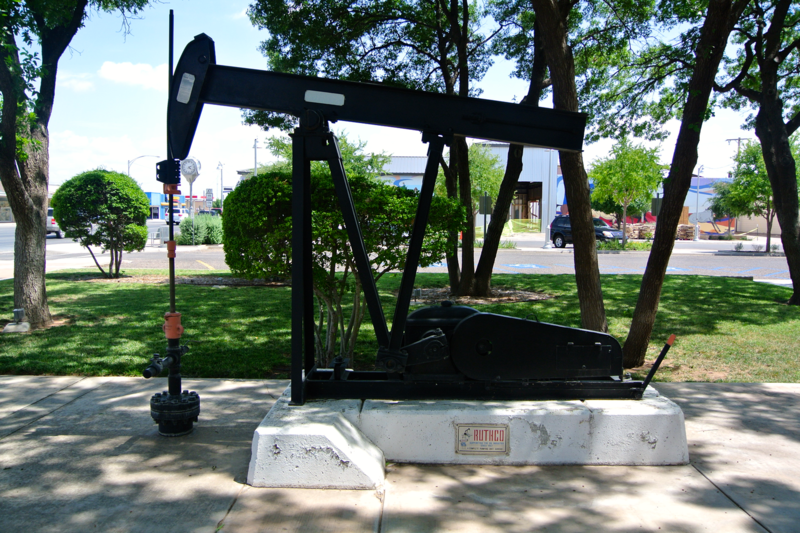 Here, I learned that the Midland/Odessa region has a similar name: the “Petroplex” (after the petroleum industry popular in the Permian Basin). 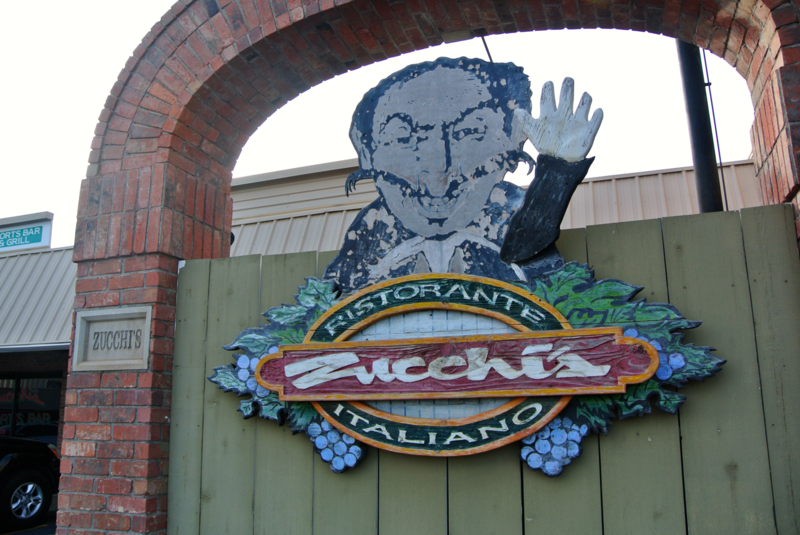 Our first stop in Odessa was dinner, which we had at a small Italian joint on the east side of town called Zucchi’s. After that, and a quick stop at Walgreen’s, we headed downtown for #217, the final courthouse of the day. It, to no surprises, is also a modern design. Who would have guessed? This one was completed in 1968, after a modern shell was put around the Moderne 1938 building. Why did counties keep doing this?! 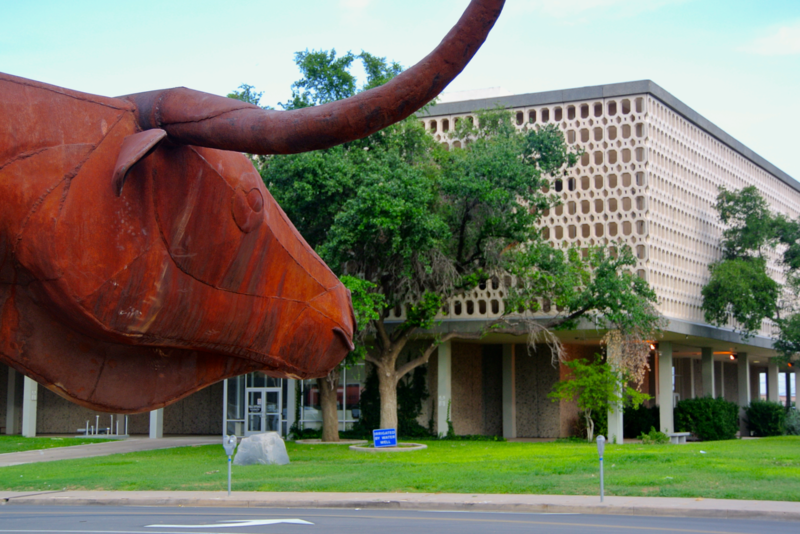 The best part of the Ector County courthouse is a large, metal longhorn steer. 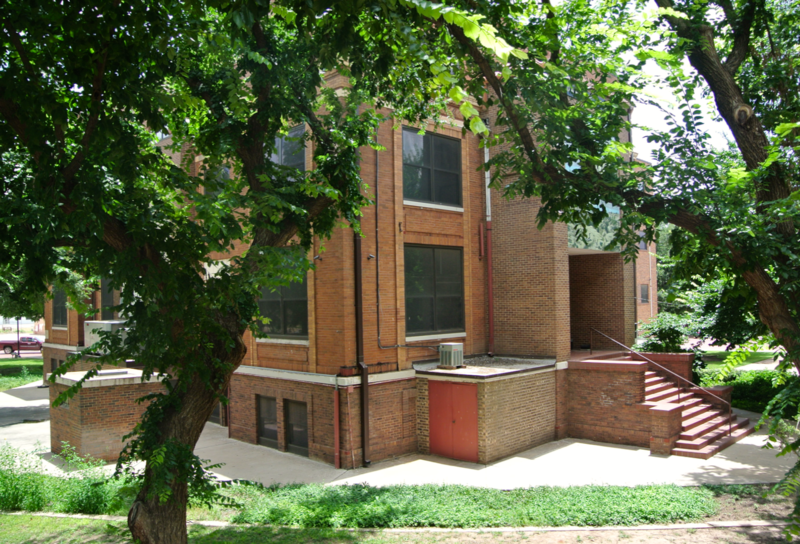 It’s located on a lot to the immediate northwest of the building. Other than that, there’s not much that stands out here. 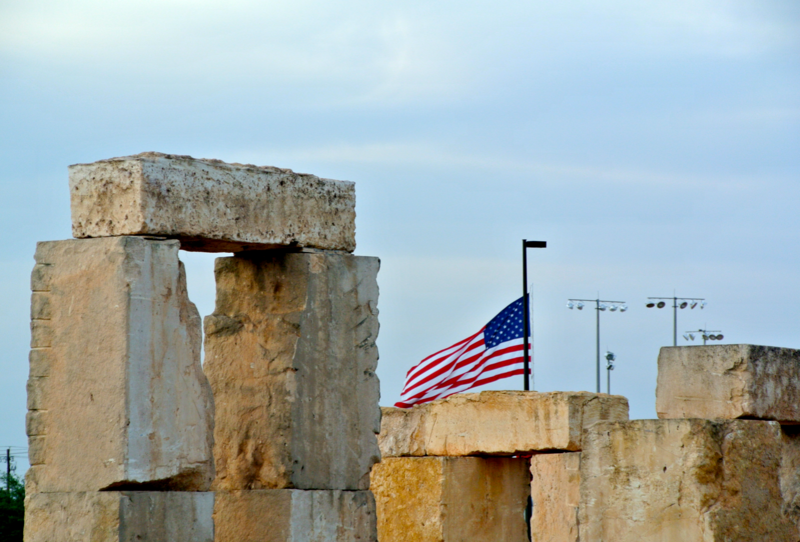 It’s a replica of Stonehenge! I’ve always wanted to travel to Europe, but specifically to the UK to see all sorts of historical sites (Stonehenge among them). 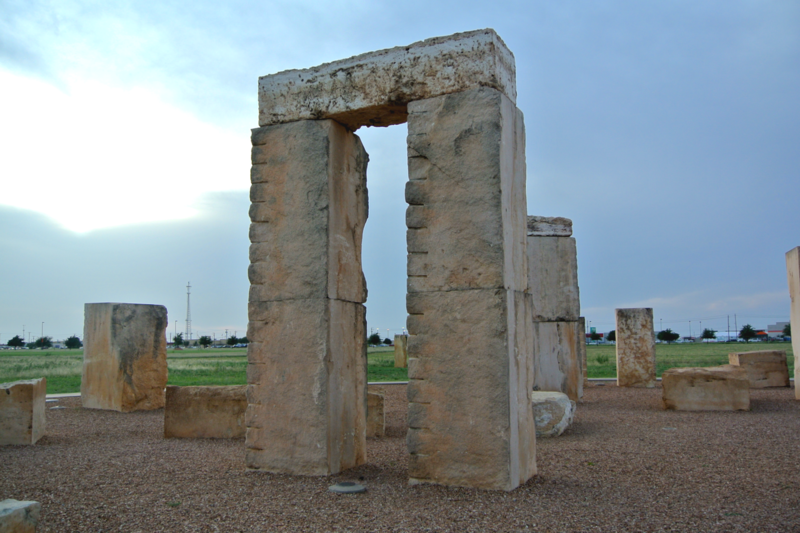 However, since I’ve never been, I enjoyed walking through the monoliths in Odessa. I understand that tourists aren’t able to access the interior of the stone circle at the real site. I also realize that the real deal looks pretty different from its replica, but it was fun to stop there nonetheless. What an interesting way to end our first day.